What's a Symfony? Or Symphony? A symphony is actually an extended musical composition written for a variety of musical instruments, usually in an orchestra. Google Symfony and you get results pointing you to free software for a 'web application framework'. But of course, I'll be talking about a lens implant for cataract surgery. The Symfony lens is a type of lens to allow for a greater range of clear vision after cataract surgery. Normal lens implants (monofocal) allow good vision at 1 particular distance, either near, or far, but not both. Multifocal lens implants can give good vision at 2 or 3 distances, but have not been very popular due to certain side effects like halos. The Symfony is kind of an in-between lens-ie in between monofocal lenses and conventional multifocal lenses. Time really flies-it's almost a year now since I started using this lens for patients. So, how's it like? In general, I would say it lives up to expectations. In this past year, I have implanted the Symfony in different sorts of situations-including for people who already have had cataract surgery with a normal monofocal lens in the other eye. With correctly done biometry, aiming for close to emmetropia (close to 0 spectacle power), the Symfony gives very good distance vision and patients were universally happy with this. 94% of my patients saw 6/6 or 6/7.5 without glasses after surgery. The remainder had small amounts of spectacle power and in one patient whose best corrected was 6/12p, she had prior retinal detachment surgery. All Symfony lens patients could see N8 type comfortably without glasses, which is this small, and 92% could see N6 comfortably without glasses, which is this small. Some patients, when asked, did describe mild halos around lights at night (such as car headlamps or traffic lights) but were not troubled by these halos. One patient even called it pretty! The distinguishing feature of Symfony related halos (mentioned by 18% of my patients) seemed to be that they were quite mild/light, and patients were able to see through the halos. There is still no perfect solution for presbyopia as yet. However, I think for myself, the Tecnis Symfony is one of the best compromises out there at the moment. 3. Optical behaviour and patient experience mimics an early stage of presbyopia-there is no sudden fall off in intermediate vision, and vision slowly gets more blurry when things are brought closer. The effect of the Symfony has been likened to vision of somebody in their early forties. With some of the other multifocals, there is really no equivalent in real life-the feeling could be somewhat unnatural and it could take some time to get used to. But the Symfony is not perfect. The chief one is as above-it is like early presbyopia. So, for people who don't mind more halos and who also don't mind a greater drop in contrast, but who would like clearer vision very close up, then a trifocal lens implant like the AT LISA tri or Finevision IOL would be good options. At the end of the day, the adage 'there is no free lunch' still holds true! Hi, no I have not implanted the Symfony post RK. I would regard this as a fairly risky situation-by that I mean there is a higher risk of an unsatisfactory visual result or of issues like halos. Each case has to be taken on its merits depending on the corneal topography, in a manner similar to post LASIK eyes. Do you recommend the lens for post Lasik eyes? I had a significant amount of last performed 10 years ago and am looking for the best option for cataract lensimplants. I have implanted the Symfony lens in a post LASIK patient, and she was very happy with the result. Again, as with RK I believe each case has to be considered on its merits, depending on factors such as patient acceptance of halos, visual requirements, state of cataract, and especially on the regularity of the corneal topography. In ideal candidates, the results can be very good. Dear Kid Bricky, I read your comment in my email, thanks very much for your message. I hope everything goes well with your surgery. Feel free to email me at poryongming@yahoo.co.uk if there is anything you would like to ask me. The halos and reduced clarity is not worth it. Hi Ann, in your particular situation you feel it is not worth it and only you can decide on that. I'm sorry you feel that way and that is why I spend extra time with my patients discussing the pros and cons of these lenses. As I have said, they are not perfect, but for those of my patients who prioritise the near capabilities, they are very satisfied with the results. I dissuade certain patients from having these lenses - those who I feel are likely to feel the way you do after surgery. I recently had implanted Symfony lenses on both of my eyes for two reasons: (1) Could not read music without very high intensity lighting. (2) Promise of being able to read books without eyeglasses. After the surgery (7 weeks after), I still need bright high intensity lighting to be able to read music,and I require 1.5 strength glasses to be able to read books. In addition, halos and star burst effects are so overwhelming that I am developing a fear of night driving. What is the most likely cause for these effects? Defective/inappropriately prescribed lenses? My eye construction not appropriate for Symfony lenses (my eye doctor examined me thoroughly pre-op and recommended Symfony)? Thank you in advance. Hi, I cannot be sure what the problem is, but it would be a good idea to ask your doctor to check your 'refractive error' or otherwise known as spectacle power. It is possible that some remaining spectacle power might be involved, but of course you also need your eye doctor to do a full eye exam to make sure there are no other eye problems that might be causing these issues. I was told that my brain needs time to adjust to the new lenses (neuroadaptation). Winter is a bad time for it, as I was told, because people tends to stay indoors and daylight is so short. I was told to give it some time, likes months, not days or weeks. I will give 3-4 months. If the neuroadaptation does not work enough to be satisfied: reading books without eyeglasses and reading music at around 30-inches, I will demand to replace them with mono-focal lenses and refund for premium lense cost that I paid for. Hi, yes, certainly the lenses can be replaced with monofocal lenses if you cannot get used to them. The chief effect is that there will be no more halos with the monofocal lenses, but the near vision could be worse without glasses unless you have some degree of monovision. If you are less than about 45-50 years of age, RLE might not be a good idea because you could experience a drop in quality of vision compared to what you get with contact lenses. With your own lens, if you are young, you have no presbyopia. So when you wear contact lenses, everything far and near is clear. This is not the case even with the Symfony, and as I pointed out above, there can be halos especially at night. Unfortunately, these halos can be disturbing for some people. If you are young, and you have such high myopia that does not qualify you for LASIK, you should consider ICL surgery instead, which will not cause you to become presbyopic. If you are already in the presbyopic age group, and especially if you are in an age group that might be expected to develop cataract soon (eg late 50s or 60s), then RLE could be considered. Unfortunately, it is not possible to predict with absolute certainty the types of eyes or people who seem to be less bothered by halos. Generally I still avoid these lenses for people who drive a lot in very dark conditions. Anecdotally, it appears to me that people who are very shortsighted with long eyeballs seem to do quite well, provided that your doctor knows to take this into account when calculating the lens power. The worse the pre-existing cataract, the more tolerant a patient seems to be to any visual disturbance after surgery, including any residual refractive/spectacle error or issues such as halos. Some types of cataracts can also cause severe halos, and having halos from multifocal lenses often is still an improvement in these patients, plus they can now see clearly in the distance and up close. Generally, RLE patients will notice any visual disturbance more than cataract patients, including the halos and some drop in contrast, so I would be a bit cautious in that regard. If your contact lenses disturb you a lot due to dryness or other issues and you would rather not wear glasses, you might consider getting some halos and drop in contrast a reasonable trade off. If you are generally fine with your contact lenses, it may be better to stick with them rather than going for the surgery. 1) will the washed out or overexposed effect evidentially mellow a bit? 2) Should I expect better distance vision from the implant? At the one week exam the doctor told me I was only one line off of what they strive for. I am seriously considering not having my second eye implanted next month as scheduled, based on the current results of the first eye. 3) Will having only one eye implanted give me vision problems I haven’t considered? Hi, I think your situation illustrates 2 things. The first is that it is absolutely critical to minimise any residual spectacle power when implanting any of these lenses. From what you say, I suspect you are slightly myopic in the eye that had surgery. That is why distance is not so clear, but reading is good. The residual myopia also explains the prominent starbursts. Since it is only one week out, the refraction might not be stable yet, so you should monitor it for the next month or so while things stabilize. Thereafter, if you still have the same problems, you should ask your doctor about options to correct the residual myopia, which will improve your distance vision as well as minimise the starbursts you experience. The other point is that I suspect your cataracts are relatively mild. As they are mild, you actually still notice that things like texture details are better in the untouched eye. I suspect that that will improve in the operated eye-usually I consider 1 month out as the time required for recovery and stabilization of refractive error. Sometimes there may be other issues like mild corneal oedema that goes away by itself. But there is really no harm in waiting, and I totally understand your reluctance in doing the second eye at this time. I generally tend to perform surgery at a somewhat later stage, when I am confident that the patient will notice an improvement, rather than a deterioration like this in the early period after surgery. Hi Jamie, there is always a bit of a trade-off in your vision depending on which lens implant you choose. With monofocal lens implants, you get the best potential contrast (after correcting for any refractive error) and least halos but the narrowest range of clear vision without glasses. With multifocal lens implants, you trade some of the contrast (together with getting increased halos) for a better range of vision without glasses. There is no right or wrong answer, and it is down to individual preference. If you are used to wearing glasses, your cataracts are mild and your vision is still good currently, you would probably be better off with monofocal implants and continue to wear your glasses, because it is more likely in such a situation, that you would get annoyed by the 'trade-off'. If you hate wearing glasses, and your vision is already significantly affected by the cataract, and also if you used to be long-sighted, you might be able to tolerate the side effects of the multifocal/Symfony lens better. When you say 'best chance of good clear vision', that actually could mean different things to different people. The more important thing is to hopefully be able to imagine what it would be like with each option, then make your decision based on which you think you would prefer. If you are not sure, do find a bit of time to talk again to your doctor about this. The thing about having different lenses in each eye, such as a monofocal in one eye and a Symfony in the other, is that it would take some getting used to. The visual quality and experience would be different in each eye. Provided you could get used to it, it could give you a kind of 'monovision', where one eye is very good in the distance (monofocal set at distance), and the other better for near but also pretty good at distance (Symfony). This situation might be good for somebody who prioritises distance a great deal but would like to be able to sometimes see relatively near things without getting the reading glasses out. However, in this situation the reading will probably not be very good and reading glasses will be needed for most document reading etc. I would emphasise that it is different for different people and it might be better to think in terms of your specific situation rather than what works for most people. Hi.I Have the same results as Janis S. I'm supposed to have my left eye done with a Symfony lens in 2 days. I'm very concerned about doing this now. My near vision is good with the Symfony in the right eye, my mid and distance vision is awful. I also have tremendous glare with headlights at night. I couldn't possibly safely drive at night. My doctor is not so easy to talk to. When I told him at my 1 week checkup that my distance vision wasn't good, he told me I may have chosen the wrong lenses. He also told me that it would probably be better after the other lens in implanted . I wonder tho, how I will see at all if the other one does the same thing. He also said that these need sometime months to really work, because the brain has to work to adjust to the lens. I'm really concerned now after reading some of these other reports. Hi, as I explained to Janis, it is likely that at this time, you are shortsighted in the eye that had surgery. This shortsightedness makes distance vision blurred, and magnifies the sensation of halos. Before cataract surgery, tests called biometry are done to measure your eye in order to calculate a lens power that will give you minimal spectacle power after surgery. These tests are usually quite accurate, but do not give perfect results everytime because of various reasons. For unknown reasons, you are probably a little shortsighted now despite these tests. The spectacle power may not stabilize until perhaps a month after surgery, so it is possible that you may see some improvement if you have not reached that mark yet. Whatever the case, you really need to talk to your doctor about your concerns. He could demonstrate things like putting a corrective spectacle lens in front of your operated eye, to show you how your vision would improve if the shortsightedness were corrected. Basically, I think he needs to address your concerns, and to regain your confidence, before doing the other eye. If despite correcting the spectacle degree (and assuming there are no other problems with your eye), you are not happy with vision in the operated eye, you might want to consider a different lens implant in the other eye. I am really stressed about decision for lenses for my cataract surgery. Debating symphony vs. Monofocal. I had last about 20 years ago with some Monofocal correction. As it wore off I used Monofocal contacts . Vision was good but was uncomfortable with night driving and the contacts themselves bothered me a lot with dry eyes and just uncomfortable so I took them out a lot and used progressive glasses. I was ready for cataract surgery when the doctor saw scar tissue on my cornea which he removed. He recommended mono vision but would do symphony lens . I am far sighted with dominant left eye but concerned about depth perception.. I don't want glasses..any suggestions? Dear Dr. Por, I am in my mid-forties and have had Lasek done 11 years back followed by an enhancement 5 years ago. Sad to say my vision is not up to my expectations and recently it is deteriorating, especially during the night, and I suffer from dry eyes. I don't want to do any more LASEK as I worry about my dry eyes getting worse, but I want to continue with a spectacle-free live as I am active in sports. Can I have Symfony lenses implanted regardless if I have cataracts (I haven't checked yet) and what are the chances of getting improved clarity bearing in my my previous LASEK operations? Hi, I think your priority should be to find out why your vision is deteriorating/unsatisfactory, because unless you address the underlying cause/causes, you will likely still be left dissatisfied. Depending on what is causing your poor vision, implanting a Symfony lens either might make no difference or even make things worse. The best thing is to take things one step at a time, get a consult to find out what the problems are, and take it from there. Hi, I am trying to decide between the low powered Tecnis 2.75 multifocal or the Symfony. I'm being told that the ML will give me better near vision but has a higher risk of halos. The Symfony gives better intermediate, less near vision, and less chance of halos. I spend lots of time on computer so need intermediate and also read lots of books, etc. so need the near. How does one decide? My ophthamologist seems really disappointed in the near vision results from the Symfony lenses that he has implanted to date. Really interested in your thoughts about comparing these two options. Also, how much overall "clearer" are monofocal iols specifically for distance than either of these 2 Tecnis options? Thanks. Clear in the distance, then gradually getting blurrer until 1 meter away, then gradually clearer until 0.5m away, then gradually blurrer again as it gets even nearer. Clear in the distance, then almost the same until 0.6m away, then gradually blurrer as you get nearer. At 1m away, things would be clearer with the Symfony than the ZKB. At 0.5m, things would be clearer with the ZKB than the Symfony. There are ways to tweak this, eg the doctor can aim for slight myopia with the Symfony, so that the best focus points get shifted slightly nearer. But in your situation, distance, intermediate and near seem equally important, so the other option would be to consider trifocals. Which to choose is complicated, and also depends on your current eye status ie density of cataract, clarity of vision, pre-existing refractive error (long or shortsight, how much shortsight...) as well as the activities you mention. It is difficult to quantify the distance clarity difference between mono and multifocal IOLs. Even optical bench testing is open to variables including in-chip processing of the camera sensor used. Suffice to say the difference in bright conditions is very small but noticeable, while in darker conditions the difference would be larger. There is no right or wrong answer at the end of the day. It differs depending on the patient, as well as the doctor's experience in using these lenses and his/her ability to customise the choices according to the particular patient. Go to a doctor you trust, tell him/her your situation and what you are looking for, discuss the choices/recommendations and try and imagine the outcomes, then go for what you think you will like. Except for the halos, any other visual issues (if they occur) are usually refractive and can be corrected with glasses of some type. Thank you for taking the time to answer people's questions on this site. Just over a year ago I had Symfony lenses put in both eyes as my cataracts were starting to become troublesome. From day one I have experienced ghosting , halos and starbursts. The stronger the contrast the greater the ghosting. The more intense the light source the more extreme the starburst effect. In addition if it is a pure colour like a red tail light or a street light I see the rings of the lens superimposed on the starburst. Having waited a year for my brain to adapt my surgeon has decided to put a monofocal in my dominant eye (initially) as I really find the poor vision I experience not worth it for the sake of the occasional advantage of not wearing glasses. Am I really just unlucky? Are there any independent studies of how often and how bad the side effects of these ( and other multifocal ) lenses are? All I can find online is personal experiences which is not very scientific, being biased towards people with bad experiences, or publicity material from companies which is obviously biased towards saying how great they are. What I try to do, is to identify patients who are more likely to be dissatisfied with multifocals and then to avoid using these lenses in them. What we know is that the ghosting, halos and starbursts are likely to be magnified by residual spectacle power (so accurate biometry is a must), and also corneal 'higher order aberrations'-small irregularities such as may be seen after LASIK/RK but which may also occur naturally. For all my cataract patients, I perform corneal topography testing before surgery and if I note significant surface irregularity I will not use a multifocal lens for that patient. However, we still cannot 100% identify all patients who will have problems like yours, so unfortunately there will be some patients who require an exchange to a monofocal despite our best efforts. In the future, this rate should get less. I have been fortunate (perhaps in being fairly conservative in using these lenses) in never having to exchange the lens in any of my patients so far. Hi Susan, yes, an eye with a buckle can still be measured accurately for a lens. All the same principles apply, but it may be more likely for an eye with a buckle to have some degree of astigmatism and be somewhat longer than usual, and if so your doctor should take that into account when choosing a lens for you. I would be more cautious in using a multifocal lens for an eye after retinal detachment surgery, but it is still reasonable if the macula had never detached, has no epiretinal membrane and is otherwise normal, and you are aware of the usual halos after multifocal lens implantation. A multifocal lens implant for cataract surgery is quite different from a multifocal contact lens (both in construction/shape as well as visual experience and physical optics), but I agree that for some people it may take a while to get used to the effects of a multifocal lens implant. A Symfony will give better depth of focus than a monofocal lens implant, at the expense of halos and a very small drop in contrast. i thank you for your willingness to answer us.I spoke to surgeon about symfony.It is fairly new here in usa but he wil explore it as well as low add multifocals.Fortunately i had an excellent retinal surgeon who seemed a bit horrified i did not want monofocal vision .My husband is an orthopedic surgeon and feels bifocal vision is best as one ages.Falls can have serious consequences.In anycase cataract surgeon exploring options.I do not think retina really affecting vision other than cataract.I did have a membrane peel and was cleared for cataract surgery at 3 months.very thorough retina I believe leaving a neatly repaired eye. my thought is symfony and finding out how near vision ends up.Then using a contact lens on normal eye for really close up..Bit farsighted but healthy eye.I like using both eyes.Not clear why retina man said monovision? You're welcome. I think your history of having a membrane peel indicates that you had an epiretinal membrane before, and there is concern that the retinal cells in the macula might have been affected to some extent. The poorer the function of these cells, the more apparent the effects of any drop in contrast caused by a multifocal IOL. I can't tell how healthy your macula is-your surgeon would have a much better idea. The longer the membrane was distorting your retina, and the more distorted (wrinkled) your retina was before membrane peeling, the more likely its function is compromised. If your retina surgeon feels that your macula is likely to have been affected to a significant extent, he would probably recommend monovision with monofocal lenses to reduce the need to wear spectacles. I read the operative report.I had a retinoschisis associated detachment.Retinal breaks at 11 oclock and 3. vitrectomy,buckle and gas to flatten the schisis cavity .Laser used for a break acjacent. 6 month follow up all quiet with retina flat and now 20/30 with 3 cataract. No mention on report of peeling and folow up had EZ and ILM intact. I am still a bit anxious over the whole thing.I find the multifocal contact lens really good despite the cataract and the specialized cataract surgeons is open to symphony. I do not know how my retina might affect my vision?It neems normal enough with no blind spots I can find?Just what the cataract is doing remains to be seen once removed.It has gone from 1 post detachment to 3 in 6 months. I see, it's just that you mentioned a membrane peel in your post of March 10. If your macula had not detached and had no other issues like an epiretinal membrane, then it may very well function normally. In which case, the main issue might be the post-operative halos, which will be present in your operated eye but not in the other eye. If this is something you think you can tolerate, and your cataract surgeon is comfortable with it, then using a Symfony would be a reasonable choice. Thank you.Reading operative report further astonishes me as to the surgical wonders you specialists do. I have seen halos for years .Not botnered by them.It wil be a relief to have my eye working again.It will distract me from the sensation caused by the buckle.No pain just a feeling eye too large for socket. Will document experience with lens once done.You are so kind to indulge our worries.Not all doctors are so nice. Hi, In a previous post, you addressed the issues with using a Symfony in one and a monofocal in the other. What about a Symfony in one eye and a ZKB low add multifocal in the other? Would this still produce some adverse issues due to two different lenses? Or would these 2 be so close that a person could optimize all distances with very very minimal downsides? Thanks. Hi Ollie, yes, 'mixing and matching' a Symfony and a ZKB is possible and may help in extending the range of clear vision for a particular patient. Nevertheless, I would still spend a lot of time to try and explain in as detailed a manner as possible what the experience is expected to be like for the patient. Patients who have had monovision before in one form or another are likely to tolerate this better, as are those who do not require good very close up vision. In the latter case, a trifocal would be a better choice. Am 66 male part time pilot not for business with great far vision. have to use 1.5 -2.0 readers would like to dump them. No large cataracts now no other health issues other than some night time glare driving. Is it worth the risk to do the Symfony Lens , money not an issue? Hi Rick, if you currently have great far vision, I would suggest not having any surgery for now. There is a chance that with the Symfony or any other diffractive lens, that you feel as if your far vision has deteriorated somewhat after surgery, and that might make you feel disappointed. Plus there are the halos to consider as well. So no, don't go for surgery just yet. I am 52. I had great far vision, good eye health, just didn't like having two have two separate prescriptions for reading and middle distance (shopping). Had +1.25 for reading and +2 for shopping. Had trifocal AT LISA Zeiss lenses in both eyes in January 2017. To say I am unhappy is an understatement. I do not have any clarity at any distance. I am unable to drive because of the halos around lights are gigantic. If I look at the moon and stars at night, I see huge halos and ghosting around them. Street lights - anything which shines. As for close up, I now have 20/20 vision BUT I cannot comfortably read without +1 glasses, as the glare and contrast makes the print look out of focus. DO NOT do it. You will lose your long distance and all clarity. It is like walking around in mild fog. I wish I could have my old eyes back. I am considering having these trifocals removed and monofocals put in. I have been unable to return to work since the operation in January as I work at a computer. Walking around shops makes me feel dizzy and sick. I walk around looking at the floor. The store signs have halo's and blurring, too. Thanks for your comments, Tweets. You've described exactly my reasons for asking Rick not to have surgery yet. I'm sorry to hear that you are having so much trouble with the lenses. They are not all bad, but they certainly don't suit everybody either. The mild fogginess of vision is due to the reduced contrast, and is especially apparent because you did not have cataracts before. It is intriguing that a pair of +1 glasses helps your reading. Do they help your distance vision and the halos too? If so, there may be issues with having residual post-operative spectacle power making things worse - in which case there are ways to make things better without changing the lens. If however, no spectacles of any kind make things better and you cannot get used to the visual side effects, then changing the trifocal to a monofocal may be the better option. Do discuss this further with your doctor. With regard to your question about wearing the +1 for reading, these glasses are the ones I wore for middle distance (watching TV/shopping) PRE-OP. One lens is +1 and the other is +1.25. The glasses are "cheap" ones and have plastic lenses, not glass. I am unsure why, but for some reason they help clarity when I use my laptop. My laptop is NOT a high definition laptop. It is nothing to do with the size of the font, as I tried enlarging the script without my glasses on and it was still out of focus. When I look at an amoled or high definition computer screen, the clarity is far better, but there is still mild ghosting. I am now seeing full circle rainbows around headlights and bright lights. Imagine a spiders web with a series of rainbows inside it. All fluorescent lighting makes everything appear out of focus, as does dim lighting. I am so depressed. I am scared of what to do next incase I lose my eyesight altogether. The people at Praga Medica don't answer my emails any more, they told me I need to wait at least 6 months and expect me to pay for explantation and implant of monofocals, stating I will need reading glasses afterwards. I originally had this done so I could see to drive, to freely walk around and be able to see street signs, labels in the supermarket, etc etc. I have paid to see a Uk surgeon who told me he can explant them and implant with mono's, but again told me I will require reading glasses afterwards. Do you know of any other solution for me? My life is on hold. I cannot return to work. My job is in an office and I work at a computer all day. Any explanations would help as I am not getting anywhere with the Company in Prague and my own Doctors in UK cannot help as I chose to have this done abroad. Many thanks again. Hi, do the +1 glasses make the distance clearer too? Do they reduce the halos/ghosting? If the +1 glasses make things overall tolerable for you, then some kind of refractive surgery like PRK or LASIK might help. If the +1 glasses don't help with the halos or make distance vision worse, you might need an explant and an IOL exchange. Of course, with monofocal lenses you will need glasses some of the time. Don't worry, you will not lose your eyesight, and one way or other things can be made better. The glasses only help me to see to type on my laptop under normal lights (not fluorescent lights). Without them, I cannot see to type unless I "force" my eyes. The whole text looks crisper than without wearing them, (but not sharp), however, if I remove the glasses and enlarge the font, the script still looks unfocussed. I can read my text messages on my mobile phone without glasses. The mobile phone screen has a better screen (more pixels). If I wear the glasses and look beyond my screen, it becomes blurred. The halo's are always there. The glasses ONLY help when using my old laptop. I have no idea why, except that it doesn't have a screen with high definition or high pixels. The same goes for the computer at work. Under fluorescent lighting, clarity is impossible. I had any eye test again a few days ago and was told my vision is 20/20. BEFORE surgery the Iscan states I require +1 left and right eye. Near addition +1.75 both eyes. UNAIDED VISION: DVA Right eye 6/12 and left eye 6/10-1 and 6/10 with both eyes. NVA: right eye 6/75 and left eye 6/75 and both eyes 6/75. I hope that makes sense. Hmm, if when you wear the +1 glasses things beyond your screen become blurred, that suggests that your current distance blurring is not due to hyperopic defocus/longsightedness. Pre-operatively you seem to have had mild hyperopia. I have to say that it is not entirely clear why your distance vision is only 6/12 and 6/10. It is possible that some degree of corneal irregularity/aberrations are contributing to your problems. Having a corneal topography done may help explain the underlying problem and perhaps suggest solutions to help you. If nothing simple helps, exchanging for monofocal lens implants will at least remove the halos (or most of them). Hi, to answer your first question, we'd need to know things like your wife's age, her best corrected vision currently, as well as the type and density of her cataract. Some of these things we can only know after examining the eye with a slit lamp in clinic. If her main complaint is that she is not able to see her iphone very clearly after spending sometime on it, it could even actually just be presbyopia or dry eyes. But I can't say for sure, since I have not examined your wife's eyes. Using monofocal lenses to achieve monovision is an alternative to multifocal lenses like the Symfony to improve the range of unaided clear vision. The decision as to which might be better depends on things like pre-existing spectacle power, previous experience with contact lenses, tolerance to halos, and personal preferences. As you might notice, the decision making process requires a lot of information and discussion, and would best be done as a consultation in clinic. Thanks a lot. Your answer is very appreciated. Hello and thanks in advance for your assistance. I had cataract surgery 2 weeks ago on my lazy eye with basic monofocal lens and in two weeks will have another one on my good eye. Now I need to decide : Symfony or monofocal. I want best possible vision with minimum use of glasses. Reading or driving with glasses is fine for me, but socially I really do not want to wear glasses. So, should I opt for Symfony or monofocal? I have to give my doctor my answer by this Friday, so he can order proper lenses. Please help me with my choice, if you can. Hi Alexandra, I presume your lazy eye has poor vision, in which case, monovision is not an option for reducing the need for spectacles. In this case, we would ignore the contribution of the lazy eye. When you say socially, you need to actually think about the visual tasks you want to perform without glasses. How about recognising a face from across the road (eg 10m away)? And being able to read a menu at the same? It is unlikely that you could do both of these tasks with a monofocal lens alone in one eye. If by socially you mean seeing faces across the table clearly, as well as your food and nearby objects clearly, you could set a monofocal lens for myopia, but then you would need glasses to see in the distance. A Symfony would give you a better range of clear vision without glasses, provided of course that your doctor gets everything including the biometry/lens calculation right. However, even in the best case/perfect surgery for the Symfony, you need to be prepared for the halos around lights at night. If you don't drive much at night or you think halos will not bother you too much and are prepared to accept them, then the Symfony is a pretty good choice. Do note that your pre-existing visual status also affects how you will perceive the post-operative visual effects. You are more likely to tolerate the halos if your cataracts were denser, and if you are long sighted (hyperopic) before surgery. If you are myopic, please note that usually you will not be able to see things up as close with the Symfony as you used to be able to before surgery (in many cases). At the end of the day, please discuss this further with your doctor, as he has all your details, including pre-operative visual state, degree of cataract, lifestyle/occupation/activities, and so on. Your reply covers everything I was questioning. I am afraid to take the chance with Symfony, because my satisfactions with the result also depends on "provided of course that your doctor gets everything including the biometry/lens calculation right", as you put it. My doctor advised me to go with monofocals, which tells me that he is more comfortale with them. I had same progrecieve glasses for about 4 years and only was wearing them occasionally (computer, reading, etc.) Almost suddenly I needed them all the time - about 6 month ago. Very soon I had to change to much stronger over the counter for reading and bit lighter for computer. I think my cataract is pretty dense, because it got to the point I was not able to read and needed to "clean" my glasses all the time. After getting monofocals for my lazy eye, which was very-very near sighted, it became much better for distance, not quite good of course, but worth for near. Still not sure what to select, have 2 more days to make up my mind. But, again, thank you very much for your input. I will read and re-read your reply. Thank you so much for taking the time to answer questions. In my 20s, I was nearsighted and needed glasses to see distance. I then began to wear contacts for distance vision. Sometime in my early 40s my close vision began to diminish so I only wore a lens in my right eye to see distance and was able to read without a lens in my left eye. With age, I began to need assistance to read so wore a contact lens in my left eye to correct my vision and have done so for almost 20 years. I am now a candidate for cataract surgery and was wondering if the Symfony lens or a multifocal lens would be a good choice? The cataract in my left eye is very small right now. The doctor recommends that the Symfony lens should be implanted in both eyes as the eyes team better. Thank you for your input. Hi Phil, in the most recent 20 years, what vision was the left contact lens correcting-distance or near? ie were you wearing the contact lens in the left eye to obtain monovision (one eye clear in the distance, the other eye clear for near, without glasses)? If you are already used to monovision with contact lenses, I think monovision with monofocal lens implants would be a good option too as you are already used to the experience. A Symfony is also a reasonable option, provided you are aware of the likelihood of halos after surgery, which you did not have before, and which you would not get if you chose monofocal lenses for monovision. If you do not drive much at night, and do not mind seeing rings around (most/all)lights at night, a Symfony could be considered. Otherwise it would be better to stick with monofocals for monovision. The choice between Symfony or other multifocal lens depends on your visual needs, your degree of nearsightedness (myopia) before surgery, and the denseness of cataract. I have had mono vision for many years. Due to my age, my nearsightedness has disappeared. I need 'cheaters' to read without my contact lenses. My left eye is used for reading (using a +2.0 soft contact lens) and right eye for distance using a -1.0 soft contact lens). When the cataract developed in my right eye (the eye I used for distance vision), I became uncomfortable driving at night because my vision was blurred. When I remove the contact in my left eye I can almost see 20/20 distance vision. During the past year I have experienced a strain in my left eye while wearing my contact which is why I considered the Symfony lens. Maybe that will improve after my cataract surgery using a monodical lens implant. So after reading JanieShaffer's problem, I was concerned that maybe I was making the wrong choice with the Symfony lens. Since the cataract in my left (reading) eye is still small, I could continue to wear a contact to correct my reading until I need cataract surgery in that eye. You seemed to have confirmed my doubts. Since the vision is so good in your left eye, and you are used to monovision, getting monovision with a monofocal lens implant might be a good idea. In this regard, you have a few options. To avoid wearing a contact lens after surgery, you could try using your left eye for distance and your right eye for near. ie swapping the eyes for distance and near. If you cannot get used to that, and you decide to have monovision, then you would continue with right eye distance and left eye for near with contact lens. I suspect some of the strain may be related to dryness, in which case you could try some preservative free artificial tears while wearing the lens. I had a symfony lens put in recently. Very happy that I am able to read now without glasses. Distance vision is not that great - if I have lasik touch up to fix distance, will that mean my close up reading vision will get diminished? The best thing to do in a situation like this is to try using a spectacle lens or contact lens to improve your distance vision. This will give you a very good simulation of what the LASIK touch up will do, including any detrimental effect on near vision (if at all). While surfing internet came across an Optica article on the SimVis.I am curious on your thoughts if this will be available in near future?Seems to be a way of removing uncertainty..
Also have a question on contrast from multifocal lenses. .How is this manifested?Ghosting? a) how it accounts for the blurriness caused by an existing cataract. ie if a patient with cataract tries the multifocal simulation, might the patient get scared off because the existing cataract magnifies the simulated halos disproportionately? b) I have patients who give me very different experiences of the halos, and I haven't been able to identify the relevant differentiating factors. If it is true that different people perceive the halos differently, then a standard simulation may underrepresent halos to some people and overrepresent them to others. I suspect that factors like corneal aberrations may play a role, as well as factors like axial length, in terms of the individual experience of the lens. I think at the end of the day, the makers of SimVis will need to come out with a disclaimer, something along the lines of 'the visual effects simulated by our device may vary from person to person'...otherwise there could be legal implications. As long as people understand that what they see through such devices is only a (very) rough approximation of what it will be like, it's OK I guess. You state that you give your patients options between monofocals, Symfony, or trifocal. What is the percentage of each of these three that make up your practice? I would think it still is much higher for monofocals. Also, how long do A-scans and keratometry readings last - 90 days, year, or longer relative to when the surgery actually takes place? Thanks. Hi, I don't keep a running tally of the lenses I use but yes, the majority of cases that I perform are still monofocals. Perhaps about 20-25% are Symfony lenses, and less than 5% trifocals. These proportions could be very different in other clinics. Likely factors contributing are patient demography (influencing activities/lifestyles, pre-existing refractive errors), denseness and types of cataracts and so on. There is no real fixed 'lifespan' for the validity of these tests but generally I repeat them after a month. I may repeat them even more often in certain cases. Generally I don't expect axial length measurements to change so often, but keratometry readings can be quite variable sometimes. You are not very pro laser assisted cataract surgery. How would you correct a 1.0 diopter astigmatism? With toric lens, limbal relaxing incisions, or arcuate cuts with a laser? If 1.0 diopter of astigmism is left uncorrected, wouldn't that contribute to blurriness for distance in even monofocals? Thanks. The lowest degree of corneal cylinder that is currently corrected with toric lenses is 0.75D. So I would correct 1.0D of astigmatism with a toric lens. I never use incisions to treat astigmatism. They are not precise enough for me. In a worst case scenario, incisions can overcorrect cylindrical errors, flip the axis and even increase the degree of astigmatism in the opposite meridian. Many years ago, while training, I came across some of these cases performed by other surgeons and vowed that that would never happen to my patients. There are many unknown and uncontrollable factors affecting the effects of an incision-that's why they are almost never used in regular refractive surgery nowadays, and instead we rely on excimer lasers or (toric) ICLs. The other thing about incisions is that they induce aberrations, and these are greater the closer the incision is to the visual axis. My left eye is the dominant eye and has a refractive error of -7.75. There is no cataract in the left eye. My right eye developed a cataract which is causing vision problems. Before the cataract developed, the right eye also had a refractive error of -7.75. I am 46. I have never wore contact lens. Always eyeglasses. I just saw a cataract surgeon and his advice is to perform cataract surgery on the right eye only. He recommended the Tecnis Toric IOL as the replacement lens as I have astigmatism. The cornea topology showed an amazingly perfect hour glass as the doctor described it. The cataract surgeon indicated due to my high myopia, it is not possible to correct the right eye to 0D without causing a visual imbalance between the two eyes, anisometropia. So the surgeon said his plan is put a Tecnis Toric IOL to correct the astigmatism and get the right eye to a refractive error of around -4. So the different between the two eyes would be 3.75. Then eyeglasses will be worn. I did asked about the Symfony len and he responded that he personally wouldn’t even consider any type of multifocals as he said his hospital had way too many patients complaining about halos. As the good left eye would remain at -7.75 and the cataract right eye would be targeted for a correction from -7.75 to -4, that do leave a difference of 3.75. Would that difference in number of 3.75 still cause anisometropia? I can't find any medical articles online to gauge what is a generally safe refractive error difference between the two eyes that the brain can handle. What is your opinion of this from your experience? What is your experience and thoughts on patients similar to me with high myopia in both eyes (-7.75) and getting cataract surgery in one eye? How would you approach it? Surgery in one eye only also? If so, what would be your target refractive error? Would you try to get it to 0D? Thank you in advance for your expert opinions. Generally the thinking is that differences in spectacle power (anisometropia) of greater than 2D make it difficult to wear glasses comfortably. This varies from person to person, but there is, in my view, a fair chance that the 3.75D difference you have may cause difficulty with wearing glasses after the proposed cataract surgery. Generally I don't like to leave more than ~-2D of myopia (after cataract surgery) also, because that causes significant spectacle dependence for many things. In your case, I would try to get you used to wearing a contact lens for your left eye. If you can wear a contact lens, then the anisometropia becomes a non-issue. It doesn't matter whether you've worn contact lenses before, this is something which can be taught and learned fairly easily. As to the Symfony lens, you have to consider the effect of getting halos in one eye but not the other. Would you be able to ignore it/get used to it, or would it bother you every time you opened your eyes? As I have mentioned before, the effect is most obvious when viewing a bright light on a dark background, such as car headlights when driving at night. If you are concerned about these halos, then just go for a monofocal lens implant and use monovision for the presbyopia (eg you can set your right eye to ~-1.75/-2 with the monofocal implant and wear a contact lens in your left eye for full distance correction). If you prefer not to wear contact lenses, you could also consider LASIK for the left eye. There are a few options for you and in some ways there is no right or wrong answer. It depends on a number of things, eg your motivation not to have to wear glasses (or not), your willingness to try contact lenses or consider LASIK, and so on. If you absolutely must wear glasses after the cataract surgery, then you must be left significantly myopic in the operated eye. I would suggest going even more myopic than -4 in such a situation, but to me this is not ideal in the long term. Thank you very much for your time in posting such a detailed and informative response to my questions. It was so helpful that it played a big part in helping me decide to cancel the upcoming surgery in 2 weeks given the risks pertaining to having the 3.75D difference that I was concerned about. I am going to schedule another appointment with a surgeon to discuss the few options you had offered. I am okay to being eyeglasses free so I will investigate that route as you had suggested. Dr. Por, are you familiar with ReLEx SMILE? That is suppose to be a bladeless and flapless refractive surgery procedure compared to LASIK. ReLEx SMILE was recently approved in 2016 for use in the USA and began to be commercially available in the USA only recently since March 1, 2017. Since it is so new here in the USA whereas it had been available elsewhere in the world, I was wondering what is your opinion of ReLEx SMILE? Have you used ReLEx SMILE? If so, how well do you think it would work for a prescription for OS -7.75-0.75x160? Do try wearing a contact lens first to get a feel of what it is like-especially the presbyopia part. Generally for cataract surgery with any type of lens implant, the spectacle power may take a month or so to stabilise. This could affect the clarity of distance or near vision as it fluctuates in the first few weeks after surgery. However, if vision is only blurry in the dark, it could be related to natural pupil dilation in the dark also. The actual halos will not change very much in themselves-however, the brain adapts and many people find the halos less noticeable over time. This period of time is variable and could be anywhere up to several months after surgery. For those who get used to the halos, they are not generally noticeable but if they think and look for them, they will still see the halos long after the surgery-because the halos are a physical optical phenomenon. Dear Dr. Ming Por. I am truly grateful for your kind answers. Regarding the issue with natural pupil dilation in the dark, I guess you means that even if I did not have the lens implanted, this should still be an issue right ? Also, is there anyway to correct this issue i.e. to make the seeing as clear in the relatively dim light as in the full light i.e. lasik? On the Halos, I actually mean Glare rather than Halo (I think halo is when you see some circle of light surrounding the light bulb, but glaring is when there is several rays of light spreading into all directions from the light bulb). For me the glare is more problematic than Halos, so would your answer be the same for Glare too (i.e. not much improvement). If this so, would the brain adapts to Glare too and after a while we would feel it is normal ? Again, would Lasik help without affecting other good results of the symfony lens ? I am scheduled for the symfony lens in late may.Curious if wearing soft contact lenses can affect the precise measurement needed?You have been so kind in answering all our questions.Just wondering at what point one should no longer use them prior to surgery. Soft lenses should not be worn at least one week from any measurements of the eye, such as keratometry or corneal topography. But they can be worn right up to the time of surgery if no further measurements are being planned. However, please check with your doctor to confirm as different clinics may have different protocols. in that eye and understood it best to use a standard monofocal lens when you have corneal damage. My dr. said I might have a bit better close vision if I go with th Symfony but that he would be happy to do either. He doesn't seem concerned about the AMD. I'm pretty pleased with my close vision now so not sure whether its worth the extra $ since the Symfony is $2600. On the other hand, if I go with monofocal am I getting into a monovision situation where I might have trouble adjusting to different types of lenses in each eye and more severe starbusts. Money isn't really an issue for me if that is the best result. Would appreciate your thoughts on this. Thank you . Hi, it seems to me that your doctor has left it to you to decide, in which case I'm assuming he feels the Symfony is fine as the AMD is mild or not visually significant at the moment. If the current starbursts/halos don't bother you and you feel vision is good with the Symfony in your operated eye, I would be inclined to do the same for the other eye. If and when the AMD worsens, vision might be somewhat worse with the Symfony than a monofocal, but I think the difference would be small as the contrast achieved with a Symfony is only slightly less than a monofocal. Thank you doctor for your quick response. I believe you correctly evaluated my situation. I am a 74 year old male who had been nearsighted and wearing glasses nearly all my life. I had one functional problem with my vision lately. I had to illuminate very high intensity lights in my room to be able to read music. I was diagnosed for having cataract in both eyes that was reducing intensity of the images. A eye doctor told me that a cataract surgery would fix that problem and recommended Symfony lenses. I was told that I would be able to read books and read music without eye glasses in addition to fixing my lifelong nearsightedness once in for all. I had Symfony lenses implanted in both eyes in December (about 5 months ago). It turned out that I could not read book without 1.25 power eyeglasses bought from grocery store. Also, I could not read ingredient list on a yogurt container nor could I read things on eye drop bottle even with the eyeglasses (I suspect ghost images and blurring). I could not read music either because of shadows or ghost images, which was the original functional problem to made me seek eye doctor’s help. Bright light seems to help improve the ghost image issues. However, I must admit that my far sight vision improved greatly. I can golf and drive without eyeglasses. So.. I essentially became farsighted with ghost image issues in near and intermediate distance. Yes I do have star burst and halo problems at night but it became tolerable after a few month. To sum it up. My Symfony lenses are (1) not focusing images in near and intermediate distances without 1.25 power eyeglasses, (2) the light coming through the lenses is not seem to be much improved, (3) shadow (ghost) images or distortion are interfering with reading music at about 25-30 inches, (4) small images like label on eyedrop bottles does not resolve at all in short distance (I suspect ghost image or distortion from the shape of the lenses). The doctor offered me to remove and replace Symfony lenses with monofocal lenses if I wished. But my hesitance is that all my problem must be caused by (1) initial measurements of my eyes either by sloppy technician or out of calibration instruments, (2) inaccurate placement of lenses by the surgeon, or (3) the lenses were manufactured with refractive errors. So I am not sure if the same doctor and the same staff would handle monofocal lenses correctly to fit my eyes. I want to hear your opinion before making decision what to do with the problem. I would very much appreciate your comments. Thank you very much in advance. Hi, it is possible that you are slightly hyperopic (longsighted) after surgery, and if so that might explain why the near is not satisfactory. The Symfony lens does not give as good near vision as other multifocal lenses, but normally things 30 inches (about 76cm) away should be pretty clear. One clue might be how your distance vision is while you wear the +1.25D readers-if you can still see well in the distance with the readers, then you might have about +1 of residual hyperopia after the cataract surgery. If so, you could consider some form of refractive surgery. Personally I'm not sure if replacing the lenses will help-since your problems are not related to overall visual quality or night time halos. But do discuss this further with your doctor. Thank you so much for your response. I want you to know that your kind attention is really appreciated. As for my problem and your response, perhaps I did not make it clear. Distant vision seems to be fine without the 1.25D eyeglasses. Problem is near and intermediate distances. I can read books with 1.25D glasses but cannot read ingredient list on a yogurt carton (small letters). It is difficult and confusing to read music without 1.25D eyeglasses because of the shadow images. Yes, but you need to realise that because of the extended range of focus of this lens, distance vision would still be relatively clear even if you are left with a hyperopic residual refractive error. In this case, even if you wear a pair of low powered reading glasses, distance would still be clear and near vision would get clearer. If when you wear the low powered reading glasses and distance gets blurred, then you probably don't have hyperopia (of that degree of the reading glasses) and you would have to look for some other cause of the blurred vision. I think the most important thing for you is firstly to get an accurate refraction (spectacle power check). The optometrist needs to give you the 'maximum plus power' that still gives you best distance vision. Several scenarios might arise from this (assuming there is no other pathology in your eyes). First, you might be hyperopic, in which case you can wear glasses, contacts or consider refractive surgery to make the near vision better. Second, you might be emmetropic (ie no significant distance spectacle power), in which case it might be best just to wear reading glasses for near. In whichever scenario, changing the lens seems rather unnecessary or may make things worse for you. In the first scenario (residual hyperopia), changing the lens is unnecessary because there are other less invasive options. In the second scenario (emmetropia), changing the Symfony for a monofocal - for emmetropia - would make your near vision even worse. If you changed the Symfony for a monofocal - for myopia - then your near vision without glasses would get better at the expense of your distance vision without glasses. Normally I would not change the Symfony (for a monofocal) unless as mentioned before, overall visual quality including distance vision is not satisfactory, or night vision problems are very disturbing. Hi Dr Yong, if we have monofocal IOL set for distance vision in both eyes, meaning without monovision, meaning glasses will be needed for reading newspapers after cateract surgery. What if we perform a Lasik subsequently to correct the longsightedness? Will we be able to see far, but yet could read newspapers without glasses? Meaning perfect vision? The problem with symphony is drop in contrast and also compromised near vision, which i don't know how drastic they will be. unselfish sharing of your professional knowledge here, which few other surgeons are willing to do so. Hi, I think what you probably mean when you say ' longsightedness' is actually presbyopia. LASIK cannot correct presbyopia. Yup, LASIK cannot correct presbyopia. So if you set monofocal IOLs for distance vision without glasses, you will need reading glasses to help make near vision clearer. LASIK could give you monovision by making one of the eyes set for distance, myopic. But then you could have chosen a monofocal IOL for monovision in the first place and then you wouldn't have needed the LASIK after the cataract surgery. Yes, if you compare the Symfony with a monofocal lens, the contrast is a bit less, but the depth of focus of the Symfony is better than a monofocal lens. You need to give up something to gain something else. I wouldn't necessarily say that near vision is compromised with the Symfony, it all depends on what you are comparing with and what your expectations are. thank you for your patience with our questions.I am getting a symfony in non dominant nearsighted eye due to vitrectomy cataract.I have used this eye for close things and small print,I may well lose really close vision after new lens.Can my dominant, presbyopic eye be switched for close up with a contact lens or lasiks?The opthamologist said one cannot switch dominant eyes but he is impatient. Sure, you could use a contact lens to make either eye myopic, but it could be difficult to get used to it because for so long now it has been the other way around. Anything is possible, but I don't think it will be easy. It's not possible to predict for certain, but again, it isn't going to be easy. But you know, instead of going through all that and having to wear a contact lens or LASIK your good eye, you could just as well implant a monofocal lens for myopia in the eye that is going for surgery. That would be simplest if very good near unaided vision in one eye is very important to you. i am somewhat monofocal now but really like the depth of focus, and distance clarity from mutifocal contact lens.However cataract progressing so best be done with worry and hope lucky to get decent reading vision from the symfony.so people with presbyopia cannot get contact lenses?i thought if i could match whatever reading i get from symfony i could read with both eyes. distance I get with good eye i could read with both eyes.? you are so helpful.I have watched eyetube discussions with assorted experts at opthamology meetings including kleinmann..even watched surgeon doing my eye .Only you have been able to answer all of our questions.Optics is very complex for the neophyte.you have a gift for explanation.my husband is a surgeon and i had to explain to him that even a routine cataract removal can be like a heart transplant to a person. I find the set focal point of monovision disturbing..Rather have as much as i can..
Basically, in answer to your question 'Can my dominant, presbyopic eye be switched for close up with a contact lens or lasiks? ', if you switched it for close up with a contact lens or LASIK, it is like having a monofocal lens implant in the eye. So in that case you might as well put in a monofocal in the first place in the operated eye. With monofocal IOLs, is it better to aim for plano (emmetropia) for optimal distance or aim for a -0.5 diopter to improve the chances of intermediate and near vision? Would I be sacrificing too much distance vision by opting to go this route? Whether one situation is better or not is very, very subjective and depends on the individual. If you like to eg play golf and drive without glasses, it would probably be better to aim for plano. If however you spend a lot of time on the computer and prefer to do that without glasses, then aiming for about -1 to -1.5 would be better (bearing in mind the need for distance glasses and also reading glasses for fine print). If your cataracts are not very bad or you have one good eye with no cataract, you can visit your doctor or optometrist and ask them to simulate it for you with glasses or contact lenses. I recently saw an ophthalmologist and from that visit, I was presented with a couple of options. I was wondering what is your opinion of the options. My good left eye is the dominant eye and has a refractive error of -7.75 with astigmatism. There is no cataract in the left eye. My cataract right eye had a refractive error of -7.75 with astigmatism. I am 46 and do have presbytopia. Without my glasses on, I can read newspaper print at about a distant of 5 inches to 6 inches away. (1) Contact lense on good dominant eye and Technis Symfony toric IOL with a target of -1 to -2 on cataract eye. The doctor did mentioned she had done lots of Symfony IOLs before but for those patients, the patients were getting Symfony IOL done on both eyes at the same time. She was uncertain what would be the result and how well the brain will adjust to having only one eye done with Symfony IOL. This seem like a concern for consideration. What are your thoughts? Has any of your patients had just one eye done with Symfony? (2) Contact lense on good dominant eye and monofocal toric IOL with a target of -1 to -2 on cataract eye. (3) Lasik on good dominant eye and monofocal toric IOL with a target of -1 to -2 on cataract eye. The doctor did mentioned it would be risky to do Tecnis Symfony IOL on cataract eye and Lasik on good eye. That is because based on her testing, she indicated there is an aberration number she saw where if the good eye was to get Lasik now, there would be a higher risk for halos if a matching Symfony IOL was to be later implanted on my good eye years down the road when my good eye develops a cataract. Have any of your patients had IOL done in only one eye while allowing the other highly myopic eye to be dependent on wearing a contact lense? I assume for option 1 and 2, I would be seeing double vision at night when I am not wearing a contact lense on my good eye. Would that be a correct guess? Thank you in advance for your help and opinions Dr. Por. A lot depends on you pre-existing practice, habits and preferences. If you are used to wearing contact lenses for distance and reading glasses on top of them for near, you might find the Symfony helpful. Otherwise, if you habitually take off your glasses to read, you may not like the Symfony that much because the near vision without glasses given by the Symfony is not as good as what you get with myopia without glasses. I would be inclined to use a monofocal toric for monovision in your case, ie aiming for a low degree of post-operative myopia. If you have experience with contact lens monovision, then this would probably be the best way to go. Having said that, I recently did exactly what you describe for a patient-a 43 year old man. He had a dense cataract in the right eye, for which I implanted a Symfony, and I did LASIK for him in the other eye which had a clear lens. He can still see quite well for near from his left eye that had LASIK (ie presbyopia not yet a problem). He notices halos in his right eye from the Symfony that he does not get in the left eye, but for him this is not too disturbing. I explained to him that in a few years' time, the near vision in his left eye would deteriorate and eventually be worse than the eye with the Symfony. I would advise you to try and imagine each scenario eg monovision with monofocal, as well as Symfony in the eye with cataract. Monovision will likely get you better near unaided vision from the operated eye, without halos, while Symfony gets you a better range of unaided vision but near unaided vision may be poorer than a myopic eye and you will also get halos in the eye with Symfony. These halos will always be present around light sources with a dark background, and you cannot get rid of them with glasses. Many people get used to them after a while, but that does not necessarily mean they disappear. As I mentioned, I would be inclined to go with monovision with a monofocal lens in your case, as the simpler option, with less adjustments needed on your part after surgery. The original Symfony article you wrote here was from October 27, 2015. Back then, based on your experience, all your Symfhony patients could see N8 type comfortably without glasses and 92% could see N6 comfortably without glasses. As for halos, you had mentioned 18% of your patients reported seeing them but that they were all quite mild/light, and patients were able to see through the halos. Since October 2015 into the present day with a larger body of patients data now, would you say that the percentages you had seen from October 2015 remained about the same? As for the halos, would you also say about 18% still reported very mild see through halos? Are there any patients reporting any bad halos that is beyond mild and bothersome? If so, is that a large percentage? Just trying to understand what are the odds of me encountering certain issues if I go with Symfony, especially the halos and how tolerable it may be. Just thinking if it is always mild/light and see though, maybe it is tolerable and worth the risk. Thank you. Hi Peter, I do not have very up to date figures on these parameters, but my feeling is that all my patients are able to see N8 type comfortably while the percentage who can see N6 type comfortably without glasses could be a little less - somewhere between 80-90%. With regard to halos, I would have to say most patients do see some halos. I mention this to all my patients considering multifocal lenses as well as the Symfony. However, all of my patients have gotten used to the halos and I have not had to exchange the lenses for any of them. I have heard of some other doctors needing to exchange the Symfony lens they implanted, but I haven't needed to do so for any of my patients. The halos may be more obvious for certain people eg if there are irregularities in the cornea/eye surface, and if there is significant spectacle power remaining after the surgery. If you do a lot of night time activities like night time driving, it might be better to go for a monofocal. If your priorities are more in terms of reduction of spectacle dependence, and you don't mind some halos around lights at night, then the Symfony can still be considered. A trifocal could give even better near unaided vision than the Symfony, at the expense of somewhat reduced contrast and possibly more halos. Thank you for the response. That was very helpful! I was watching two Youtube videos where Dr. Shannon Wong (an ophthalmologist) was documenting his experience with picking the Symfony IOL for his own eye and then seeing the before and after results in the videos. In the video, a Dr. John Odette did mentioned to Dr. Shannon Wong that he noticed with Symfony IOLs, if the target was plano to -0.25, he noticed people wouldn't have as bad the halos. Whereas when the target was -0.75, people would notice the halos more. From your experience, is that what you noticed too? Do you mostly target your Symfony IOL patients for plano to -0.25 then? It sounds like I should ask my ophthalmologist to target plano to -0.25 too then with the Symfony. Hi, yes, as I mentioned halos are more obvious if there is significant spectacle power post-operatively. Therefore if you have -0.75D post-operatively, generally you would have more halos (in the distance) post-operatively compared to if you had plano. But of course, if you had -0.75, the near vision would be great, better than if you had plano. So it is a trade off, depending on what your priorities and preferences are. Thanks for your links to the videos. I guess I am more conservative than Dr Wong, and I would concur with Dr Odette that I don't generally recommend this kind of surgery in the absence of a cataract-where the distance vision is still very good. This is because most people do not understand the compromise that must be made, and may find it difficult to accept the distance blurring and halos that occur after surgery, which they did not have before. So Dr Wong only managed to persuade Dr Odette to do his surgery, because Dr Wong knew exactly what he was getting himself into. Of course, it is different if there is already a cataract present. In such cases, especially with dense cataracts, many patients are happy regardless of the presence or absence of halos post-operatively. would you recommend a mono-focal for the left eye say set for near? It seems that now, my left unoperated eye tones down the halos. I heard mono-focals don't give you halos as much as a symfony. If I had a symfony put in the left eye, would my starbursts be twofold? I also noticed with the symfony that blues & reds appear differently. Some reds appear fushia in the light, but not inside. My gas stove flame looks like a purple blue. Have you ever encountered this? Also, A friend of mine had a mono focal put in one eye only, and he sees color the way I do. Any guidance, would be greatly appreciated. I'm not sure I have all the available information to give you definitive advice. But yes, I think if you had a Symfony in the other (left eye) then it is reasonable to think that the starbursts may be more obvious, at least initially. You wouldn't see 2 of every starburst, but whatever starbursts were present would be harder to ignore initially. You should expect what happened in the right eye, to happen in the left too, assuming that both eyes are otherwise healthy. The interesting thing you bring up is you think your unoperated eye tones down the halos. You can try covering your left eye tonight when looking at a light source-do you really see the starbursts more when looking just with your right eye? And less with both eyes open? If so you may be right in thinking that the left eye tones down the halos and in that case you could consider a monofocal in that eye. I am not sure about the colours that you see, but it is possible that they are just due to the fact that these implants whether monofocal or multifocal are totally transparent, whereas your unoperated eye sees things with a yellowish tint due to the cataract. You may be more used to this tint than the colours as seen through a totally transparent lens. I re-read all your posts in this blog to help me decide which path to take. I am leaning towards going with a contact lense for my left eye and a Symfony lense for my right eye. I am drawn towards the potential benefits of the Symfony giving me a continuous vision from at least far to intermediate, with some near. If the spiderweb/halos are mild and see thru, I suspect I would be ok trading that off for the gain of having far to intermediate vision with some near. Would that be a realistic expectation from your experience? Dr. Por, as for your 43 year old patient whom you recently implanted a Symfony in right eye and LASIK on the other eye, do you remember how nearsighted was this patient? Around -7 to -8? With astigmatism? How quickly did this patient neuro-adapt with just one Symfony in one eye? Was he generally happy with the results? Did he made any complaints about lower ability for night vision driving? Thanks Dr. Por for your time. Hi, my patient was a low myope who habitually wore contact lenses for distance. I think he was about -3D before surgery, with no significant corneal astigmatism. But astigmatism shouldn't really be a problem because with proper measurements and planning, the toric Symfony is very good at overcoming this problem. He's done well and is happy with the outcome, driving at night with no problems. But he does see the halos in his right eye-so sometimes it comes down to the individual personality as to whether someone can and is motivated enough to put up with these halos. Most of my patients do mention that the halos become less noticeable over time, through what you might call 'neuro-adaptation'. This process is quite variable and I would expect it to take some months to occur. I found this picture online where someone had described what the Symfony spider web halo looked like to him. Based on your patients' experiences, would this image matches what your patients had described for their halos? Thanks Dr. Por for your time. I have not yet had the opportunity to ask my patients about this picture, but Dr Shannon Wong had a Symfony implanted in his right eye and says that this picture is an accurate representation of what he sees. I had a symfony implanted yesterday and am i thrilled.colors are really vibrant.And have 20/25 after less than 24 hours from a basic blur..I did see the spider web last night with my eye dilated.A reflection off a water faucet had a perfect web..However morning it had gone ..Surgeon told me comparing eyes is not the best idea to maximize results .I am just so thrilled to have depth of focus and essentially have my eye back.. I have yet to see how halos are tonight with pupil of normal size.Personally halos might be a small price to pay for restored vision. Reading on ipad quite easy with print made slightly larger so have no complaints ...Thank you Dr Por for all your information.I read over all comments to everyone. What info would you need for more definitive advice? I was told that my corneas where very healthy. I have done the one eye thing and can say that the starbursts are more prominent in my right eye, and with the left un-operated eye I get soft halos around lights and with both eyes the effects are toned down. Color. Say, I am outside looking at a red pointsettia bush with my left eye. It is red, but with the right symfony eye it appears fushia. With both eyes it is still pinkish. But if I go inside, with my left eye the bush is red, right eye is red, both eyes is red. I think it has to be the light outside. The stove's flame appears light blue with left, with symfony eye alone, it is a deep purple blue, with both it is still purle blue. My friend, who had one eye implanted with a mono-focal lens sees color like I do. We really didn't do the one-eye test. But his wife says he sees color differently, and she is cateract free. I have a theory about the starbursts etc. I think it may be the material and the sharpness of the edges on iols. It seems people have more trouble with halos etc when acrylic iols were introduced as the material of choice. What if the edges were more rounded? Perhaps, the flickering on the side one gets after implantation could be lessened. What about smoothing out the etching of the rings? Also, acrylic iols are more reflective. Could this be contributing to the halo effect? I have read that when a patients acrylic iol was replaced with older (I think Pmma material) that their halos, starbursts went away. Thank you for the quick response. I really appreciate what you are doing. I suppose my statement is a kind of disclaimer, which actually applies to all those people asking specific questions here, because I have not examined your eyes myself or done a proper consult. This needs to be borne in mind and at the end of the day you need to make decisions in conjunction with your regular doctor. Try and imagine the starbursts you get in your right eye, in your left eye as well. If you think this will bother you a lot, you could consider a monofocal IOL in the left eye. Having said that, in general most patients with a Symfony in one eye have the same in the other eye as well to achieve some balance in terms of the benefits. As I mentioned, your colour perception difference is most likely due to the transparency of the lens implant. A cataract free patient who is in an older age group like your friend's wife most likely also has natural yellowing of her unoperated crystalline lens, so yes, she may see colours differently. The yellowing blocks blue light more than other colours of the spectrum, so the difference in colour perception will be more obvious when there is more ambient blue light (such as when outdoors). The halos are due to the diffractive rings, you get them also with camera lenses with this design. It is an inherent optical property and not due to the material of the lens. If you rounded the edges you might get less halos but then you would also lose the effect you were looking for - ie multifocality or extended range of vision. Positive 'dysphotopsias' related to light reflections from lenses are less with low refractive index materials like silicone, but nowadays we don't use this material as much because of things such as its tendency to spring open suddenly in the eye, perhaps somewhat higher posterior capsule opacification rate and possibility of being affected by silicone oil in the eye if ever retinal detachment surgery needed to be done in future. I am now on day 3 of symfony lens.Visions seems to be getting sharper though do not have exam till tues.I found i can read a menureasonably well.I may never have the myopic super great close vision but it does not bother me.The total visual experience is so great.My untouched dominant eye seems to be losing out to the implanted one.Color wise The rrich blues seem to be evident as I use both eyes.My dominant eye had an astigmatism but it almost seems tne symfony eye is over riding it. Thanks to you Dr Por I was able to make a convincing case for the lens.It is quite new here in the usa.I was measured many times prior to femtolaser..and maybe even during if my memory is correct. I saw 2 mild streaks of light coming from a candle in a dark restaurant..Nothing that bad and we t away when i used both eyes as dr suggested.The novelty of such great vision in a almost worthless buckled eye is wonderful. Thanks Susan for sharing your day to day Symfony recovery status. It is very encouraging to hear how well yours have turned out. It gives me hope. Do you know what was your surgeon's target number for your Symfony implant? Around plano to -0.25? How well and fast did your brain adapt to having one Symfony in only one eye? Were you very nearsighted in the eye that had the Symfony implant? Thanks for sharing your experience. Thanks for the update! You did great by doing so much research and getting your expectations right-such as giving up the great myopic close vision for a much greater expanded range of unaided vision with the Symfony. You can still get really great very close vision with a simple pair of readers if necessary. I think the mild streaks of light you see will probably go away in the next few weeks to months-it is quite common early on to have 1 or 2 mild 'striae' or 'wrinkles' in the capsule in which the lens sits. As these smoothen out, the streaks often get less and disappear. hi steve...from what i gather my eye used a 5.50 multi focal contact lens.Tnere is a scleral buckle on eye which had further increased myopia..the cataract was a 3.... my good eye which probably was not all that great had an astigmatism and 20/30 vision..i rarely used glasses as i could read with one eye and had decent distance vision. Now despite my reading everything I am not a super type A..I wanted my eye back as it felt dead what with buckle and cataract.I will have a second appt tomorrow..I kept mentioning to surgeon how hard it must be to get perfect measurements on an eye with avitrectomy..In anycase i was measured alot.Corneas several times, A scans B scansin the past months..
Lenstar etc..the retina surgeon who was around was dubious about retina patients having this lens..he looked at retina several times .I was at a big ny city hospital eye dept..Macula was not affected but eye had alot done.The symfony is new here though has been discussed at lots of meetings...i think tne fda consultants had used it tne most. I asked for the best total vision in that eye and i would deal with needle threading etc once I saw what I had..i can live with carrying reading glasses just in case..so far amazing..infinity is sharp, clear as is everything up to my eye ..The gradual fall off of close vision is gradual..objects are focused as i bring them closer but not enough to read fine print..Bigger print yes. Dr said use both eyes.I am still comparing but noted my dominant eye may be challenged by the other eye.I see it in the colors and actual sharper vision..colors are most amazing especially blues..Looking with both eyes I now see the blue leaves amongst tne yellow ones in the garden.. I think we all may vary.We are writing here because we want to learn everything .bit compulsive..I did not want monovision as i was tired of myopia where beyond a few inches focus disappeared..Now any drop in focus in my eye is gradual and only tiny print cannot be clear...so i will ask tomorrow...I did have femto laser surgery which seems to be easier on tne eye.I have had minimal signs any surgery was performed..
i would say a few days out carrying drugstore reading glasses is a tiny price to pay for such panoramic vision.. Thank you Susan for the detailed information. It was very helpful. forgot To add I had a regular symfony ZXR00 +14.50SE 13 mm and 6mm have no clue what this means Dr Por?it s on card I was given..Retina surgeon had finally agreed to use this lens.Its problem here is special lenses and femto are extra and not covered by insurance.Personally I would fore gp dinners out, starsbucks etc to save the money to pay the extra cost...monovision for me was ok but there is some strain reading wirh one eye..once again this is rather exciting vision to have..as dr por said there are tradeoffs ..I am still healing so will update ..
when reading wirh one eye..
Hi, the information on the card is just for reference. ZXR00 is a lens code referring to the Symfony lens, +14.50 refers to the refracting power of the lens implant used, 13mm is the overall diameter of the lens implant from one end of the haptic ('leg of the lens') to the end of the other haptic, and 6mm is the diameter of the lens optic (focusing part of the lens). thanks to you Dr Por...had check up 5 days post op..have 20/25 which dr said should improve and close vision will also..Said no perfect lens yet.We will not have the vision of a child .Pleased my expectautions included loss of super close up in exchange for panoramic clarity.. Yes am sure lots of cockamammy advice on internet but finding you as a genuine expert was great.I do think anyone who expects total perfection will be disappointed..the perfect iol is yet to come.. I am now 8 days postop...still exploring my new vision.Close up focus is dependent on light I find.I can read very small print outdoors in the bright light.Indoors it is different..I use an ipad so can make type slightly larger and reading is then easier. But unless outdoors small type is blurry..However i am also used to holding reading matter fairly close due to former myopia..Now holding things futher away helps in clarity. I would say outstanding up until the last maybe 18 inches where the focus falls off gradually..not so much outdoors though..
Not sure how healing affects it all...am still on gradually decreasing doses of drops. i only saw spider web once on tne first night.It was off to the side...lights at night have a light halo less than when i had the cataract.No starbursts.Tail lights look ok.With cataract were gigantic. That's very interesting. I think it demonstrates the extended focal range well, because those reflections would have been quite close to your eyes. Glad to hear too that the halos are not troubling you at night. an additional comment..i can describe the lens as giving vision the calibre of an ipad pro as opposed to an older one or even to the best tv screens available here in usa.There is an almost 3-D effect even with only using one eye..
Hi Dr. Por. I had a Symfony lens implanted in my right eye over 4 months ago. It had to be removed as it turned out that a slight astigmatism I had did not show up right before the procedure, so my distance eye sight actually got worse. I had pretty good distance vision in both eyes before the procedure and got this to reduce my dependence on reading glasses. I had another Symfony lens implanted 3 weeks ago today to allow for the astigmatism. I notice that the distance vision is back to normal but my reading is in no way improved. I read here that some people notice improvement very shortly after surgery. How long should I allow? My doc says to allow at least 3 months but studies seem to show that most people notice significant improvement in 3 weeks. Any suggestions? Hi, perceptions of improvement depend on both the original state of your eyes/vision, as well as the outcome of surgery. We do not know your age or what kind of reading vision you had before surgery, so it is not easy to comment on your outcome. But usually with respect to near vision, I would expect it to stabilize in about 3-4 weeks as that is the time usually taken for the refraction (spectacle power) to stabilize after cataract surgery. If people find halos troublesome, then I think it is reasonable to wait 3 months because some people can take longer to get used to those. If you have a look again at my personal thoughts in the blog post above, I mentioned that the Symfony is not perfect and the near effect is similar to mild presbyopia. If you had mild presbyopia before surgery, then that could be a reason why you don't notice much improvement. But in the first few weeks it is also possible that things may improve as the refraction stabilizes (it can change a little), so especially since you already had 2 surgeries, I would wait a little before doing anything else. PS: has anyone else noticed that their vision is not as good in the eye with Symfony 3.5 weeks out? I still have a blurriness which was supposed to be resolved with the correct lens (for astigmatism). See description above. Doc suggested waiting 3 months but that does not seem to be the norm, with most people experiencing noticeable improvements in a short period of time (3 to 4 weeks post surgery). Thank you for any guidance/suggestions. Hi, if your near vision in the operated eye is not as good as the unoperated eye, one possibility is that the post-operative refraction (spectacle power) is slightly hyperopic (longsighted). It is possible for the slight hyperopia to disappear a few weeks after surgery. There are other potential causes of blurry vision, which would require a more comprehensive work-up, including the accuracy of the astigmatic correction and whether there are possible retinal issues. With mild or minimal cataracts, there is a higher risk of experiencing no or minimal improvement from the surgery. But actually feeling worse is not so common and you might want to consider getting a second opinion from another doctor. Thanks so much Dr. Por. I went in yesterday for a 5 week check up. My vision has improved in the eye with the implant but the left eye is still better for distance, middle and near. They suggested that if it doesnt get better, the can fix it with Lasic. When I mentioned that this is only for distance and not near, they said in this case, reading should improve too. What do you think? It's somewhat unusual that your left eye is still better for all distances. I can't really say why, it could be anything from a refractive error to some other problem or perhaps your left eye is just still very good (so your right eye is less good by comparison). LASIK can only help if it is determined that a refractive error is causing the problem ie if your visual problems can be solved with glasses, then that spectacle lens power which improved your vision could be incorporated into your eyes with LASIK. If your right eye vision does not improve with glasses, I don't think LASIK would help either. Yes, the right eye can definitely improve with glasses. I use 1.5 and can see very well at computer distance and reading up close. I presume this means that there's a refractive error. Will I have to choose between distances, up close vs. far away? They are also thinking of implanting the left eye for up close and fixing the right for distance. I'm just not sure what to do at this point. Halos are significant. I'm not sure how I'd handle both eyes...thanks again. It's very important to clarify. You mentioned that your left eye is better for distance, middle and near than the right (with Symfony). Without examining you, I cannot say for sure why that is the case, but here are some possibilities. If the right eye is hyperopic (or has astigmatism), a monofocal spectacle (ie single vision, not progressive or bifocal) could help it see better for distance, middle and near. So if there is this one monofocal spectacle that makes all distances better, then you could get the same effect with LASIK. PLEASE NOTE: I am not talking about readers which make near vision clearer but far vision blur. If you use 1.5 to make near vision clearer, but while you are wearing those, distance vision is blur, that does not necessarily mean LASIK will be of any help. LASIK will also not help if the blurring is from some other eye problem like retinal or corneal problems. My feeling is it might be best not to do anything to your left eye for now. It all sounds a bit strange and I think you probably will want to consider getting a second opinion from another doctor (with a full consult in clinic and not just over the internet like this). as to unknowns query..while I can see close up it is not perfect...I could read smallish print in bright daylight but not in a comfortable way for a long time. I am curious Dr Por...I have a plus one cataract in other eye.Could a symfony set for greater close vision be used in that eye?I am finding the quality of symfony eye taking over from the other eye.Colors and sharpness are much better..I doubt a multifocal could give such great panoramic clarity.That eye has a healthy retina? Hi, yes, a Symfony can be set for better near vision in an eye, at a small expense in terms of distance clarity. So, far is slightly blurrer, but near can be significantly better when this is done. This difference between the 2 eyes would be much smaller than for conventional monovision with monofocal lenses, and is generally easier to get used to. Would like to seek your advise. I am 33 years old male and was diagnosed with mild cataract in my right eye. My right eye is my master eye. I have went to eye specialist and they suggested me to hold off the surgery. My right eye vision will turn blur in outdoor sunlight condition. I also have difficulty see signage and fine prints words on computer. So would like to ask when can I have surgery and is it possible to use extended focus lens for right eye only? I wanted to be spectacle free but yet is aware of the side effect of the multifocal lens. My work requires me to regularly use laptop and read documents as well. As such I am keen on the extended focus lens which I believed will have less halos yet have better intermediate and near vision. Hi Mr Peh, it does sound as if you are affected by your cataract in terms of glare symptoms and general blurring. I cannot give you definite advice about when to have surgery, but generally speaking we consider doing the operation when vision is affected and we think the surgery can help to improve your vision. More detailed advice, including your suitability for multifocal/extended range lenses can only be given after a proper history and examination of your eyes is done. You might want to consider a second opinion with regard to your condition if you still have difficulties after the last consultation. 2 weeks postop observation...I have found my prior, nearsighted reading was done far closer than is ideal with tne symfony.I am finding small print is far clearer when i hold the reading matter furtner away..this is something I have not done in years and has made small print clearer..so what was my near vision now exists further away..Kind of hard to change a habit but does mean the symfony can give near vision though as Dr Por said less good but still there.. Thanks Dr Por for your comments. I really appreciate your help. Regarding the color perception, It is only some reds that look like fushia in sunlight. So far, I have 3 things that look fushia. I have found, that wearing my glare reducing sunglasses, turn those items red. Could I be seeing the blue based dye in them? I did look at the picture of a halos with a Restor lens in Right eye and a Symfony lens in the left eye. The facsimile of the symfony lens is close to what I see, but mine are a bit brighter still. My Dr. told me I had a mild secondary cateract in the operated right eye. Not significant but he didn't want to treat it with a lazer if I decided for an lens exchange. I like the multifocality, the halos are softer, so I think I will keep the symfony in my right eye. My question is: If I have a mono-focal put in the left eye should it be set for distance so that it would reduce the halo effect? If I have a Symfony put in the left eye should the Dr. shoot for plano? DV OS-Sphere Plano, clylinder +2.00 Axis x168 V/A 25-2. NV OS +2.75. I am wearing these glasses now with the right lens removed and can see fairly well still but I notice some changes in my left eye. Would you recommend a Toric lens implant for the left eye? I'm trying to get the best result for my situation now. Any advice would be greatly appreciated. Hi, it is possible that your glare reducing sunglasses have a yellowish tint which filters out some blue light, thereby changing the shades a bit. It is possible that after your second eye is done, that your brain gets used to the new shades and after an adjustment period begins to perceive colours as how they should be. Currently you may still be more used to the shades in the eye with cataract and are perceiving a slight yellow tint as being 'more normal'. I suspect that you will be happier setting whatever lens you decide to implant in your left eye, for distance. This is what you are used to, and you don't mind reading glasses, so go with the distance set up. Whether you go with a toric implant depends on your 'keratometric cylinder' ie the astigmatism of your cornea-this may or may not be the same as the astigmatic correction in your glasses. But certainly, if you did have 2.00D of keratometric cylinder I would use a toric implant as I believe these to be the most precise way of reducing post-operative astigmatism. There are different ways of measuring this keratometric cylinder; personally I use a Sirius corneal topographer which also measures posterior corneal curvature to give very precise readings of the corneal astigmatic power. I forgot to mention that a ptergium was removed from my left eye in the l970s. It was growing from the corner of my eye and was growing a little on the iris. I have had no reoccurrances. The eye is healthy. I sew, do floral arranging and interior design as hobbies now so color perception is important to me. So near vision is important to me but I don't mind wearing readers for close work. As it is now, I use my existing glasses for sewing and do just fine. Again, thank-you for your input. I called my doctor's office and spoke with the tech, the results of my eye exam in Feb, 2017 showed that the right eye which has the Symfony lens was at 20/25 which they considered Plano, and I had no astigmatism. But I also asked about my measurement for astigmatism before surgery, Tomography showed l.17, Manual 1.12 but Toric lens was not put it. Instead, the lazer was used to correct. Apparently l.25 is the theshold they use to decide if a Toric is needed. I also asked what my measurement was in my left eye. The astigmatism measurement was .59,tomography Was .47, manual .62. One thing the tech suggested regarding the halos is that my left eye has a cataract that may soften the halos. Interesting thought. Maybe that's the reason my halos seemed toned down. The tech also mentioned That if the lens is placed or settles more forward in the "bag" the patient may have more problem with halos. Do you concur? My next appointment is in Aug, and I will discuss these issues with the doctor. Probably my surgery will be in the fall. I will keep you apprized. Still haven't decided which lens. Again, thank-you for your help. Generally, cataracts tend to block or scatter light. In the eye with cataract, some patients may notice halos. So I don't think it is the cataract softening the halos per se; rather, the halos are better with both eyes open (compared with when just the right eye is open) because you don't see the Symfony halos in the left eye, that you do in the right eye. I would not expect the position of the lens to affect the severity of halos per se. However, a lens which settles more in front or behind than expected may cause residual spectacle power, and this residual spectacle power may cause more halos to be perceived. now 3 weeks with symfony.Outdoors I feel as though have perfect vision.Can read small print.Indoors it depends on light close up..But i love to use the latest ipad pro for reading and with the resolurion of that screen can read the smallest of print. I do have a question however.Now and then i try to focus with both eyes and can feel the lens in my eye kind of move.Think i will stick to passive focus as it somehow does not seem a good thing to do..could it displace the lens?? Hi Susan, I don't think actively trying to accommodate/focus can physically move the lens implant to any significant extent or displace it. Some people notice a transient quivering of images for a second or so when looking from one object to the other, but I have not heard/seen reports of noticeable visual changes when people try to focus. Hi, it is hard to be sure that your recurrent iritis is related to the surgery, but it is possible. You cannot have a cataract growing on the Symfony lens. Your doctor will know best what your situation is, and whether your vision will return to normal as there are many things to consider like the health of your retina and optic nerve as well. Thanks for your comments. I am 43 and I have needed glasses for reading for the last 12 years. Recently I was prescribed Bifocals which is down to Presbyopia I presume. My prescription is +3 Right eye with -1 Astigmatism and + 2.5 left eye with -0.75 Astigmatism. My goal is to be spectacle free as I do not want to spend the next 20 years changing Bifocals and getting used to them when there is this technology available. I know the risks and I reckon I could put up with Halos if I didn't have to carry glasses everywhere as I am in sales. Also I do a lot of sports and don't want to start wearing glasses for distance. I have no cataracts or other eye problems and I am told that I am suitable for corrective laser if required. My surgeon has suggested using symfony (29) in my right dominant eye and Technis MF +2.75 (28.5) in my left eye for better close up vision. I had initially thought I would go with Symfony in both eyes but my surgeon is very experienced and has done many 1000s of operations so I can see what he is trying to do and his proposal makes sense. I would appreciate any comments on my situation. I have never tried contact lenses. Generally I avoid doing refractive lens exchanges, ie lens surgery in people without cataracts. This is because the quality of vision you get with the lens implants, especially multifocal lens implants, is not quite as good as what you get with your natural lens while wearing glasses/contact lenses. This does not just apply to halos at night; in normal situations you may notice contrast is not as good in the eye with the lens implant-this is an unavoidable optical compromise to allow for multifocality. Colours may appear slightly washed out, or things may appear to have a slightly misty covering. It is not terrible, and certainly cataract patients notice a great improvement from their vision with a cataract, but you are coming from a position of perfectly clear vision with glasses, so there is a higher risk you will feel a deterioration of vision after surgery compared to somebody who does have a cataract to begin with. As you are only 43, I would try wearing contact lenses first to achieve good distance vision in the first instance. Then if you are OK with those, either continue wearing the contact lenses (with readers over them if necessary), or consider LASIK so that you don't need the contact lenses to see clearly in the distance. Thanks for your comments on whether the cataract is softening my halos. I agree with you it's because I don't see the Symfony halos in my left eye and when I look into the distance, I am using both eyes, so the left is tempering the effect of the halos. I think I will go with a mono-focal in the left eye, set for distance so that my halos would be minimized. This will happen in the Fall. Thank you Dr for your kindness in answering our concerns. I had my almost 4 week postop with symfony lens.This is in an eye with a buckle, and macula on retinochisis detachment.I am tnrilled with clarity but surprised it is still 20/25. i am pleased it is as good as this but wonder if it could still get even better?still on pred and anti inflam for a few more days.how does a lens stabilize?is it neuro or mechanical? i forgot to add tech who checked vision said he thought the surgeon had gotten it just about on target..so one more line would have been perfect?This is quite a complicated business! Hi Susan, is the 20/25 vision with or without glasses? If it is, for example, 20/25 without glasses but 20/20 with glasses, then it is due to a small amount of spectacle power and I wouldn't worry about it. As much as we aim for zero with sphere and cylinder, it is possible that a very small amount remains such that uncorrected vision is not quite 20/20. As long as you have vision that suits your needs and expectations, it sounds like a very good outcome. It might get a bit better still, but most recovery and healing has occurred by this time out from surgery. yes 20/25 without glasses and really rather great even with not being sure of letters in a lower line..wonder how eye chart would be outdoors? Interesting how daylight makes a big difference in reading fine print..Outdoors full range.Why does light make such a difference?Find it takes effort to hold ipad, books etc further away than I ever did.. efore one broyght things closer now further away..Thank you again..
That's a very good outcome indeed, 20/25 without glasses. I think having bright daylight helps because it naturally makes your pupil smaller. A smaller pupil has 2 effects-one being that it helps to reduce excess light entering the eye, but the other being that a small pupil gives you a 'pinhole' effect, which in itself also extends your range of clear vision. Thank you again.You must have very happy patients with your thorough answers.Do not lose that quality. My surgeon will be using a Toric Symfony lense with the CATALYS femtolaser for the upcoming surgery on my right eye which has a OD prescription of (sphere) -725 , (cylinder) -225 , (axis) 28. I know the Toric is intended to correct for astigmatism. At the same time, I noticed the paperwork stated limbal relaxing incisions (LRI) will be performed at the time of cataract surgery to reduce astigmatism also. What is your opinion on having both LRI and Toric Symfony done concurrently during cataract surgery to correct for astigmatism? Most information found online describes it is normally one or the other. I couldn't find any information on having both LRI and Toric done together during cataract surgery. Is it because my astigmatism is high so both is needed to reduce it? Thank you for your time Dr. Por. The astigmatism that we try to neutralise during surgery is the corneal astigmatism, which may be different from the astigmatism in the spectacle prescription. From your post it seems that the spectacle astigmatism is -2.25D, but the corneal cylinder could be more or less than this. In Singapore, the maximum corneal astigmatism that can be neutralized by a Toric Symfony is about -2.50D with a ZXT375. So if your corneal astigmatism was higher than this, theoretically you would not be able to fully correct it with a Toric Symfony. Personally I do not perform LRIs as they are not quite as predictable as other methods like toric lenses or laser refractive procedures like PRK/LASIK. However, it is possible that your corneal astigmatism is beyond what the Tecnis Symfony can correct/neutralise, and it is possible that your surgeon has had better experience with LRIs than me. I know you must be very busy but would really appreciate your experienced opinion on my situation from post on June 22 if you had time. Thanks in advance Brian. It would be good also as there may be something I am missing as this is all quite complicated. Thank you for your kindness in sharing your time and expertise. Would you mind sharing also your opinions on the IC-8 small aperture IOL, and, secondly, your opinion on the lipoic acid choline ester? I understand the latter is under investigation for topical use in reducing cataracts and restoring flexibility to the presbyotic lens, and I am curious as to the current stage of its research, whether it holds promise, and whether it is available anywhere for clinical use. Hi, I personally have not used the IC-8 IOL. I think it would behave similarly to the Kamra corneal inlay, with the big difference being that with the IOL you don't have any risk of corneal haze or refractive change. The intrinsic properties of looking through a small aperture would remain, and would include better depth of field (extended range of clear vision) but with the associated cons of darker vision and possible increased prominence of floaters. It is also possible to get some halos from diffraction associated with a small aperture, however, these halos are going to be different from the halos of a diffractive lens and are likely to be less intense. I came across some information about lipoic acid choline ester and reversing presbyopia, but nothing about cataract yet. I suspect that it may have some temporary beneficial effects with presbyopia, but is unlikely to make much difference with cataracts. The pathogenesis of these problems is in all likelihood too complex to enable a single eyedrop to cure them. The substance is not commercially available as an eyedrop anywhere at the moment. i’m considering to have a Symfony implanted, but have doubts. I’m 39 and have a cataract in my right eye, my left eye is fine. In my work as a sound engineer, vision between 50cm and a 100cm is very important, but being able to keep eye contact with performers on stage is also nescesary. I work in dim lighting circumstances a lot of times. I also drive at night on a regular basis. Being able to see clear on all distances i need for my work is a great prospect, but i’m also worried about the glare and halo issues asociated with this lens. From reading your experiences, i learned that very precise measurement and placement are key factors in minimising these visual effects. But are there any other factors that influence the level in which these effects take place? Also, is there anything to be said about what kind of personality is more likely to be bothered by the effects? The other solution would be a monofocal lens. But what depth of field do these have when set around 70cm? will i be able to see small text on a screen sharply at 50cm and printed text and meters on a device 90cm away? And what if i’d have a monofocal lens set for distant vision, combined with glasses for near/medium vision, how much of a usable range would that give me when waring glasses? Could i see sharply from 50cm to 90cm? 60cm to 80cm? smaller? Hi, thanks very much for reading this blog! For many of the questions you ask, you should spend time and discuss this in depth with your doctor during an actual consultation. For example, how small do you mean when you say small text on a screen? I also do not know your current and past spectacle powers eg, whether you wear glasses and how strong they are. The halos are due to diffractive optical effects-there is no running away from them and some people who are very observant and perhaps 'perfectionist' in a way may find it harder to ignore or get used to them. But being aware of them is already a good first step. Some of the most unhappy patients were those that underestimated or were unaware of the halos. The range of clear vision with a monofocal lens is narrow, and gets narrower the more myopic you set the post-operative refraction. There is some variability so I would hesitate to be more specific than this. The variability depends on things like your natural pupil size and the ambient lighting conditions. A Symfony would provide significantly better depth of field than a monofocal, for any given situation, provided your eyes are otherwise normal. In your situation, since you are 39, you will probably use your good left eye for near for quite a few years to come. So if you have a monofocal lens implant, or a Symfony lens implant for your right eye set for distance, either way your left eye will be doing most of the near vision tasks until presbyopia sets in a number of years down the road. Overall if you drive at night often, and you are worried about halo issues, you might be better off having a monofocal lens set for distance, especially if before the cataract developed you had good distance vision without glasses in the right eye. Then you will just use your left eye for near vision, or occasional reading glasses to help your right eye see near if you want to read for long periods. Tomorrow i will speak with my ophthalmologist and discuss these matters. I wanted your input because you have experience with the Symfony lens. Thanks for sharing your insights, it's of great help. Dear Dr.Really enjoy stopping by your website.So nice to have a Dr willing to explain the complexities. I am a curious type.I wrote of being thrilled with symfony lens 20/25 vision and able to read small print.So far only retina repaired eye done.I collected my records for my files.I have all tne computer printouts of formulas for the lens.Iitially too complex but think i figured them out.They give probabilities of which lens leaves residual myopia? I saw the 14.5 lens i have can give anywhere from -29 to -41. would i be correct in that this is micro monovision?that if other eye is implanted at 00 it would be be a blended vision? Yes, in order to choose lens implant powers we perform tests called biometry, which measures the eyeball curvature and length. These are fed into formulas which generate printouts, which list lens implant powers on one side and the predicted post-operative spectacle powers on the other side. I don't quite know what you mean by a 14.5 lens giving -29 to -41. A 14.5 lens of a particular design/brand having a particular 'A-constant' will only give one post-op number, not a range. SEQ .31 wish i could send screen shot..One result on each scan was highted at closest to 00... both eyes were done.there was also listed ACD which might be anterior chamber depth? this lens is quite new here and my surgeon was new to it..
above these scans was K1,K2 readingd.and adjusted k and average k...all rather fascination.From what i could tell a 14. would be closest as it came up on all the printouts.But i have a card with 14.50.. this is not my dominant eye and has been my reading eye..I am guessing other eye should be right on target for micro mono? when summing up symfony is great but at its best with plenty of light. Hi Susan, yes, ACD is anterior chamber depth. The SRK/T, Holladay II, etc are names of different formulas that help us to predict what spectacle power you will get if we implant a particular power of lens implant. As the formulas are different, the results they give are also slightly different but generally will agree quite well. Some formulas may be better at predicting certain types of eyes and it's good to have a few different ones to compare. Holladay II is one of the newer ones which take more different eye measurements into account, but SRK/T is a very good general purpose formula as well. I have a feeling your doctor has chosen exactly the right implant power for you, from what you describe. We sometimes may choose one that is a bit more or a bit less than what is predicted by the formula to be closest to zero, depending on our experience with the formula and depending on what we are trying to achieve. Thanks for your update and feedback, it is true that light helps, even for monofocals, by creating a pinhole effect and improving your depth of focus. 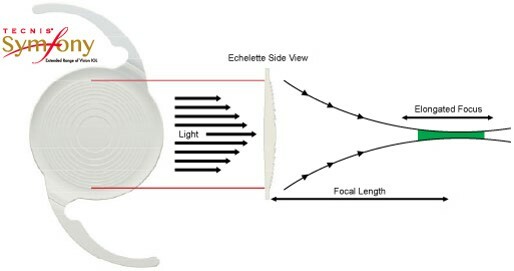 For diffractive lenses, the lens optics is associated with mild loss of light from scatter, so bright light also helps improve contrast with them. wow thank you!what a treat to discover questions answered.I would guess with symfony not known for close up it best to tend to slight myopia rather than farsighted in making predictions.or educated guesses...? Now in sept get toric symfony for other eye.I have time to surprise them with my knowledge!Thank you again. I am a healthy 50 yr old female and have developed an early cataract in my right eye. I had LASIK done 16 years ago & my eyes were very stable for 15 years. When my vision got worse I discovered it was caused by a cataract. I have been checked by 2 doctors and I do not have keratoconus and my LASIK is stable. Both said the flap looked very good. Unfortunately, my doctors differ on the lens I should get. One recommends the Crystalens. He said he's never had to remove one and his patients are very happy. He said I could be spectacle free within 20 ft (in house) with micro mono vision & only need glasses for driving. He doesn't like the multifocal lenses including Symfony because they block light. His motto is: 'Go with nature (the Crystalens flexes like your natural lens), and thou shall not block light from the retina’ (the Symfony lens blocks light). He said it is also more problematic after LASIK This doctor performed my LASIK 16 years ago & I was very happy with the results. He does not offer the Symfony lens. The 2nd doctor recommends Symfony. He says it is better than the older multifocal lenses and will give me a greater range of vision than Crystalens. He does not like the Crystalens because it does not work for all people and he cannot explain why when it does not work. He is the doctor I was sent to for extensive testing to rule out keratoconus. He also discovered a small cataract in my left eye that I am not noticing yet. He thinks it will be difficult to give me the vision I am looking for by implanting only the right eye since I have also re-developed some myopia in the left. (Left eye is dominant = intermediate/distance and right eye = very close work.) He does not offer the Crystalens. My dream is to return to where I was with LASIK – not needing glasses except for night driving. (I am fine with that.) I want to be able to read sheet music and have my best vision to be intermediate. I would also like to read isle signs at the grocery. I don’t mind reading at a slight distance (book on lap, same distance as an iPad). I want my food to be in focus, not blurry when I eat. Currently I have my best vision working at the computer, eating, reading iPhone, etc. without glasses. It starts to get blurry without glasses about 1.5-2 meters away and I must where glasses to drive. I also wear reading glasses for very fine up close work (e.g., removing a sliver from a finger) but this very infrequent. I am constantly taking my mono vision glasses on and off throughout the day. I do not know what to do. Both doctors make a good case. My instinct generally is to go with nature & I don’t like the idea of light being blocked from eyes. But maybe the technology has improved and I would gain greater range of vision with Symfony than what is possible with Crystalens. Maybe my old doctor is clinging to old technology and I should go with the young doctor since I will have this lens for a very long time. Hi, thanks for your very detailed post. I have to say I concur with your second doctor more, with regard to Crystalens vis a vis Symfony. The main issue with the Crystalens is its reputation for being unpredictable, with regard to accommodative effect, as well as final post-operative spectacle power. Even if the Crystalens can accommodate initially, this ability may be lost with time as the capsular bag in which it sits 'scars' or fibroses with time. In Singapore, the Crystalens was introduced, then later withdrawn from the market when doctors would not implant the lens. The extended range of focus of the Symfony on the other hand is predictable and permanent. What is less predictable is how well a particular patient tolerates the side effect of night time halos. I am more cautious with regard to post LASIK patients, because their corneal shapes vary depending on degree of myopia corrected, how well centered the LASIK ablation was, and in general the current degree of 'aberrations' or surface irregularity. For a post LASIK patient, I would look carefully at the corneal topography, as it is possible that higher amounts of wavefront aberrations increase the perception of halos after Symfony implantation. I have implanted the Symfony in a few post LASIK patients, and fortunately they have all done well. However, pre-operatively I spend extra time counselling them about the halos and the possibility of lens exchange if it doesn't work out. At the end of the day, it is a judgement call regarding whether a particular patient, with their particular post LASIK corneal shape, will do well with the Symfony lens. 2. Symfony lenses. This is a bit of a judgement call, and depends on your doctor's assessment of your corneal shape and risk of post-operative visual side effects. Generally the less spectacle power you had before LASIK, the better your chances of a good outcome with Symfony, but again, this is a very individual thing. Please bear in mind that some patients find the halos from diffractive lenses (including the Symfony) disturbing for driving at night. These halos cannot be made less by glasses or any other intervention, but many patients get used to the halos with time-in such cases they only notice the halos when they 'look for them' or think about them. I think the Symfony will be helpful for your other activities so long as the lens implant power is accurately calculated for. Thank you for your throughout reply. I have been thinking about it for several days. You are the first to state an issue (other than not working) with the Crystalens (fibroses with time). Another doctor stated 'If the accomodation doesn't work then you will be left with an expensive monofocal lens'. My thought was 'Well, if the Crystalens doesn't accommodate then at least I tried to extend my range with areduced chance of halos/glare than with the Symfony. And I still have a good monofocal lens.' But you're saying this might not be the case. I might end up with a monfocal lens that grows fibroses over time. It appears any lens I choose there are potential issues. I have been scouring the internet looking for a the consensus. Most point toward Symfony EXCEPT for certain cases after LASIK. Then the consensus points toward Crystalens but does warn of capsule fibrosis over time. Since I'm 50, 'overtime' is probably going to happen. How high is the probably that I develop fibroses? And if I do develop fibroses what is the disadvantage? Accommodation doesn't work anymore? A need for additional surgery to remove then? Impaired vision? With Symfony it's 5% chance I'll have issues with halos/glare and may need readers for very near work. But I could also have worse intermediate vision which is where mainly I live (distance being 2nd). Ideally, I'd like excellent intermediate vision, very good distance vision, and good/decent near vision. As long as I can read the speedometer, computer, iPad, music at a piano, and see well when I'm riding my bike, running, surfing, etc. then I'm ok needing readers for closeup work (reading a medicine bottle, taking a sliver out of my finger). Almost all intraocular lens implants are designed to be implanted within the empty capsular bag, and this capsule can fibrose over time with any lens. This is not a unique issue with the Crystalens. Generally, patients with the Symfony lens have quite good intermediate vision. However, near vision for close up reading is often better with a low powered pair of reading glasses. ...I have the symfony now for almost 3 months.The quality of vision is brilliant and almost 3d.Last check up far was 20/20 and reading card was 20/30.dr said no lens will give perfect vision of a child yet but this is pretty close. Halos only exist if i look for them.I carry plus one drugstore reading glasses which i have yet to use.vision is perfect outdoors for all size print,Inside i need light to read well...My trade off.I found reading newspapers etc on ipad perfect.No glasses. gredient part of package.There is no sudden drop off to blur as with nearsightedness.Dr Por?what do you think of the FDA trial?both eyes emmetropic vs one set .50?idea to add lines to near vision..called nano or micro vision..I have one eye to go.I asked my dr to see if he could find info..dr eric donnenfeld one dr doing trial. Thanks for your additional comments. All important information that I am considering carefully. Susan - have you had LASIK? That seems to be the biggest concern regarding using Symfony. The other being that my non-dominant eye is the one with the troublesome cataract. However, I have a small cataract forming in my dominant eye that I have not noticed yet. The 'Symfony' doc said it can be difficult to do one eye and not the other (since I've regained some myopia in my dominant eye. He suggested I wait to see how fast the small cataract grows. He thought it best to do both eyes together. Dr Por - what do you think about doing eyes separately, possibly years apart? Susan - you seem very happy with Symfony in 1 eye for 3 months. Do you have any myopia in the other eye? Have you had any issues only having 1 eye 'fixed' for 3 months? BTW - As advised by doc #2, I am currently waiting 6 months to recheck my LASIK corneal flaps. Neither doc thinks it will be an issue since they were stable for 15 yrs prior to my cataract discovery visit. Still, he advised I wait to also see what happens with the other eye's small cataract. 6 months is up in October. i did not have lasik but i had retina surgery for macula on detachment.And a scleral buckle.I was not a candidate for multifocal.However I did not want monovision.Through Dr por and reading clinical trial info on symfony especially dr kleinmann from israel i saw it was used on " difficult cases" and was quite successful.Both retina and cataract surgeon reservedly agreed to my request.Its success has opened doors for other People.Try and find dr kleinmann video or read symfony info on trials to see if used on lasik.Think dr por has? Thanks for this info. I will definitely look into dr kleinmann video & clinical trial info. Knowing a non-dominant eye can become dominant is interesting, too. I'll be sure to ask my surgeons about this & how they intend to set my eyes. Currently the large cataract eye is set for near micro monovision (this was since LASIK - 16 years). Probably depends if they do them together or years a part. Your comment regarding your 'good eye' not being as good as you thought is interesting, too. I thought my 'good eye' just had more floaters but at least it would focus. Now I'm wondering if the 'floater effect' is really the beginning of me noticing the small cataract. And maybe this eye isn't as good as I think either. Hum - lots to think about! Can you tell me about the possibility of implanting the Symfony in someone with glaucoma? I am 64 and was diagnosed 7 years ago. It remains stable, RE mild, LE borderline. IAOP 19-20 in both. I have a cataract in the right eye and a small one in the left although the left one is not troubling me and seems likely not to do so for some time. I wear single lens glasses for distance and have never needed glasses for reading. In fact I still enjoy taking them off for many activities---even now with the reduced vision I have with the cataract. It has been suggested that I have a monofocal lens implanted in the right eye, set for distance, then later the same in the left, set for near to give me a type of monovision. I am having great difficulty adjusting to the fact that after the surgery I would permanently lose the near vision in my right eye and the stereo acuity up to about 10 feet. I would dearly love to have a fuller range of vision. Multifocals have not been recommended to me but I wonder if the compromise of the Symfony would work well for my situation. Are there any studies to indicate how glaucoma patients do with the Symfony and are there any reasons you can think of for not implanting the Symfony in an eye with glaucoma? Hi, the big issue with glaucoma patients is the degree of optic nerve involvement-which can manifest in the degree of visual field loss and also how much of a general reduction of visual sensitivity there might be. 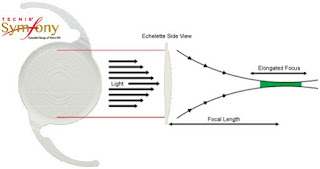 This is because, with all diffractive lenses including the Symfony, there is some loss of light due to scatter and due to the spreading out of light into either several focal points or a range of adjacent points. If you have pre-existing visual issues from the glaucoma, then it is possible that diffractive lenses could exacerbate some of them, especially when compared with monofocal lenses. In a similar way to post LASIK patients, whether a glaucoma patient is suitable to have a Symfony is a judgement call and depends very much on the state of the nerve as well as the stability of the condition. This must be left to the individual patient to discuss with their doctor. Every case is different. It is important to realise that monovision does not entail 'permanently' losing near vision in one eye. The near vision in that eye will be just fine with a pair of reading glasses, which of course may not be needed that much because the other eye would help with near vision. If you prefer to read without glasses in both eyes, you could even opt to have both eyes left mildly myopic (with monofocal lenses) and then continue to wear glasses for distance vision-pretty much the way you are now. These options are all possible and the pros and cons of each have to be thought through and discussed with your doctor. I have a few questions i would really love your answers.After my laser cataract surgery with symfony I note all the previous floaters seem to have gone.Where can they be?the back of the eye is sealed isn't it? One other question.If natural lens has volume and artificial one is flat is the capsule able to shrink wrap around the new lens smoothly?I have one diagonal streak looking at right lights at night.Not bothersome to me but wonder where it comes from? A wrinkle? Hi, I don't think the floaters have physically disappeared. They are shadows of vitreous gel remnants, and those remnants are usually not touched or changed during the surgery. Most likely, the focus of your eyes has changed after surgery, and being more blurred in your vision than before they become less noticeable. It is possible that small wrinkle(s) in the capsule can give rise to streaks of light, although to be sure the streak was caused by that, you'd have to take a look to see if it really was present or not. These may smoothen out by themselves over time, if present. I am a 44 year old woman with extreme myopia since I was 4. Left eye is -15 and right eye is -11. I have been wearing glasses and contacts for the last 40 years. In the last year or so, I had trouble driving at night, as the headlights blinded me completely. I also failed the night vision test and am in the early stages of cataract. I also have slight astigmatism in my eyes. A week ago I had my left eye surgery with symphony lens and am scheduled for my right eye surgery in another week. I currently wear contacts in my right eye. For the past few days, when I see through the left eye, I notice the halos and the starburst of the headlights,brake lights and street lights. I am getting a little concerned. 1. Is night driving going to be worse when my right eye is also implanted with symphony lens? 2. Although I have clear vision near and distance in my left eye with the symphony lenses, Do I have the option of having monofocal lenses in the right eye, considering my myopia? 3. If monofocal lenses is an option for my right eye, would you recommend any specific one and would that help reduce the halo and starburst effect while driving at night? Please advise at the earliest. Thank you so much for your time. Truly appreciate it.
. Everyone went through cataract will automatically have presbyopia about 3.0D because the new IOL lacks the flexibility of natureal lens (in your eyes) in movement.
. In order to allow Symfony IOL to let you read small print line (as shown by Dr. Por's article), the Dr. has to adjust the power of Symfony, say -3.0D (short-sighted), so that you can read letters in 33.3cm clearly. However, you lose the intermediate and far vision to some degree (or a lot).
. The refractive power of Symfony can be determined pre-op and the best reference of the extent of adjustment is the published graph "DIOPTERS of DEFOCUS" in Abbott's website, which I found to be close to my expeience. You need to tell your dr what you want and ask your dr to tell you what kind of vision you will get or not get. the moderate glare/flare and starbursts. Fortunately, my left dominate eye automattically balances the glare/starbursts from the Symfony right eye, and cut down the effects of glare/starbursts to 30% to 50%. Not satisfied but acceptable. I visited to was reluctant (too busy) to talk to me so I googled a lot to find an excellent doctor who I can talk, communiate, and trust, even though his clinic is 110 miles away from where I live. I am totally satisfied with my Dr. and satisfied with my IOL op.. Hope this helps.